Stand firm friends beneath it all. On the part of the public there is general appreciation of the spirit which these two academies have brought into the great autumn sport, a spirit which combines with football per se the color, the martial pomp, the elan of the military. The merger is a happy one, because football in its essence is a stern, grim game, a game that calls for self-sacrifice, for mental alertness and for endurance; all these are elements, among others, which we commonly associate with the soldier’s calling. 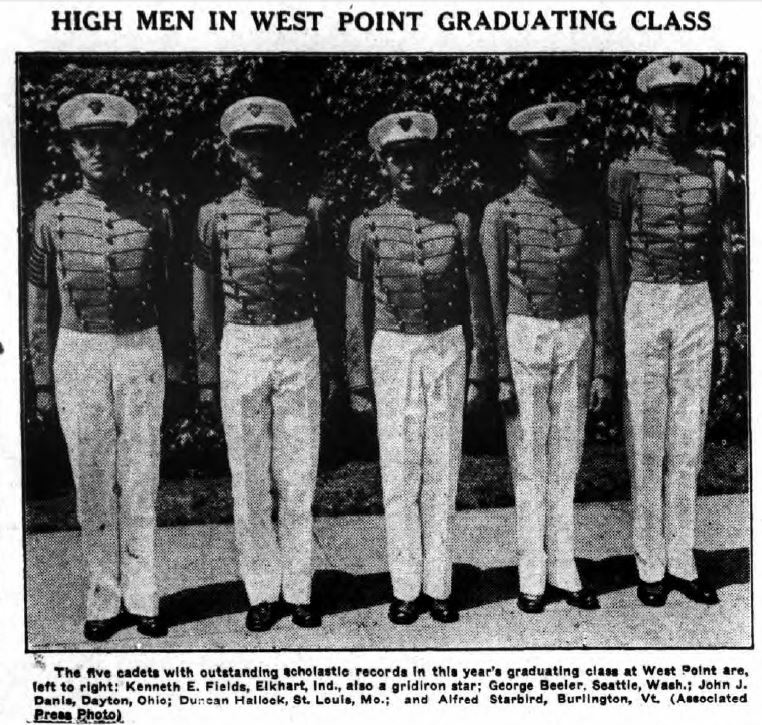 If West Point and Annapolis players are not young men, who, after graduation, will go out into the world in various civil professions or other pursuits relating to commerce and industry, they are men, on the contrary, who are being trained to uphold the honor of our flag at home or abroad, as fate may decree—fighting men whose lives are to be devoted to the National weal. It would be strange, therefore, if games in which those thus set apart participate, were not marked by a quality peculiarly their own. To far-flung warships the scores are sent on the wings of the wireless and there is elation or depression in many a remote wardroom in accordance with the aspect of the news. 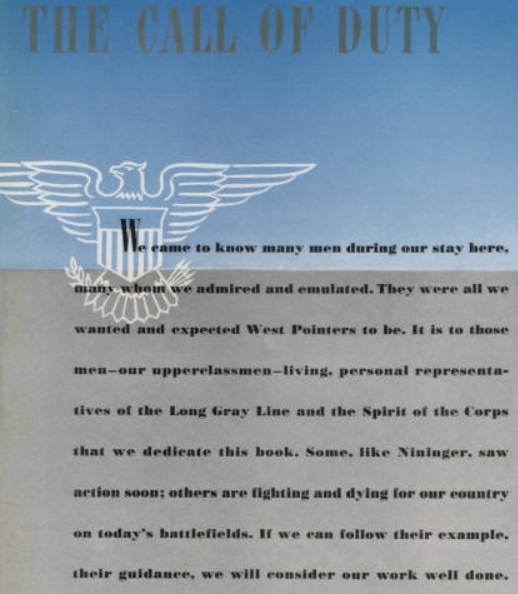 In lonely army posts wherever the flag flies word of the annual struggle is flashed alike to colonel and the budding second lieutenant still with down on lip, [Pg 196]by them passed to the top sergeant and so on to the bottom of the line. Every football player who has had the good fortune to visit West Point or Annapolis, there to engage in a gridiron contest, has had an experience that he will always cherish. 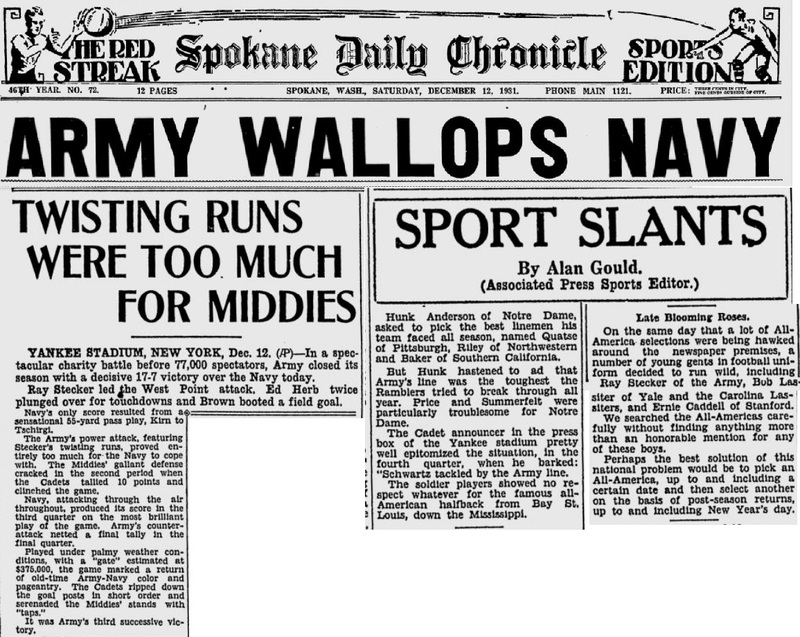 Every team, as a rule, looks forward to out of town trips, but when an eleven is to play the Army or the Navy, not a little of the pleasure lies in anticipation. Mayhap the visitor even now is recalling the officer who met him at the station, and his hospitable welcome; the thrill that resulted from a tour, under such pleasant auspices, of the buildings and the natural surroundings of the two great academies. 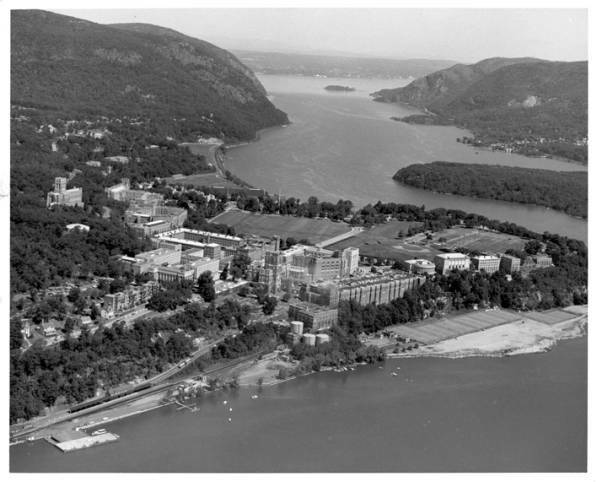 There was the historic campus, where so many great Army and Navy men spent their preparatory days. 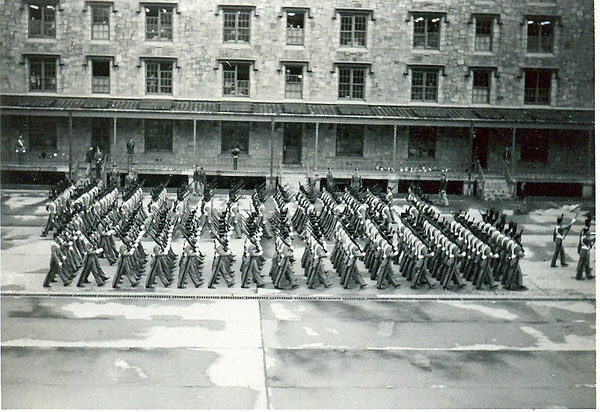 An inspiration unique in the experience of the visitor was to be found in the drill of the battalion as they marched past, led by the famous academy bands. There arose in the heart of the stranger perhaps, the thought that he was not giving to his country as much as these young men. Such is the contagion of the spirit of the two institutions. There is always the thrill of the military whether the cadets and midshipmen pass to the urge of martial music in their purely military duties, or in equally perfect order to the ordinary functions of life, such as the daily meals, which in the colleges are so informal and in the mess hall are so precise. Joining their orderly ranks in this big [Pg 197]dining-room one comes upon a scene never to be forgotten. In the process of developing college teams, an eleven gets a real test at either of these academies; you get what you go after; they are out to beat you; their spirit is an indomitable one; your cherished idea that you cannot be beaten never occurs to them until the final whistle is blown. 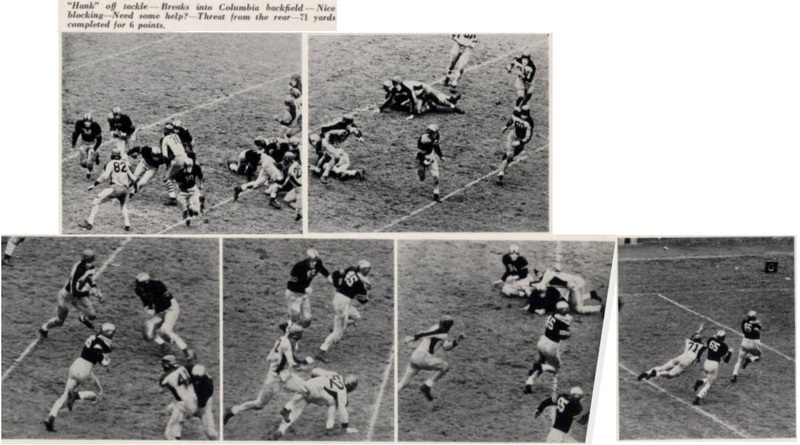 Your men will realize after the game that a bruised leg or a lame joint will recall hard tackling of a player like Mustin of the Navy, or Arnold of West Point, souvenirs of the dash they put into their play. Maybe there comes to your mind a recollection of the Navy’s fast offense; their snappy play; the military precision with which their work is done. Possibly you dream of the wriggling open field running of Snake Izard, or the bulwark defense of Nichols; or in your West Point experiences you are reminded of the tussle you had in suppressing the brilliant Kromer, that clever little quarterback and field general, or the task of stopping the forging King, the Army’s old captain and fullback. I have always counted it a privilege that I was invited to coach at Annapolis through several football seasons. It was an unrivalled opportunity to catch the spirit that permeates the atmosphere of this great Service school and to realize how eagerly the progress of football is watched by the heroes of the past who are serving wherever duty calls. It was there that I met Superintendent Wainwright. His interest in Annapolis football was keen. Another officer whose friendship I made at the Academy was Commander Grant, who later was Rear Admiral, Commander of the Submarine Flotilla. His spirit was truly remarkable. The way he could talk to a team was an inspiration. 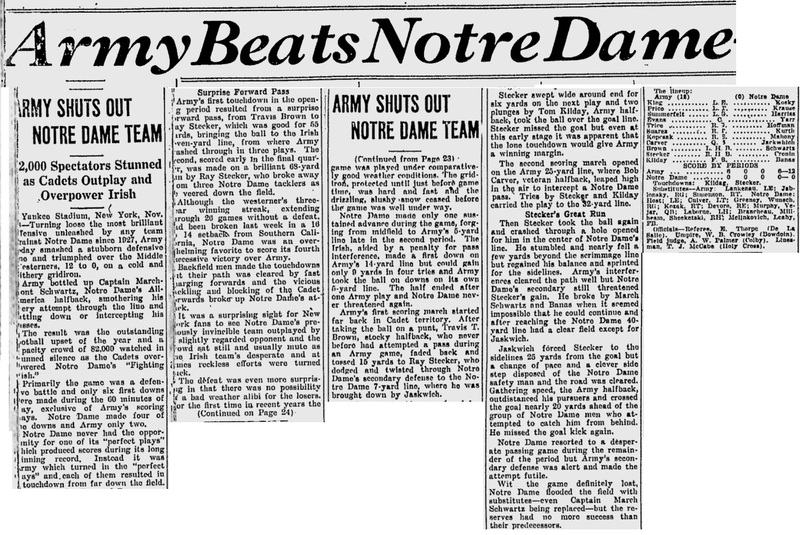 It was during the intermission of a Navy-Carlisle game when the score was 11 to 6 in Carlisle’s favor, that this exponent of fighting spirit came into the dressing-room and in a talk to the team spared nothing and nobody. What he said about the White man not being able to defeat the Indian was typical. As a result of this unique dressing-room scene when he commanded the Navy to win out over the Indians, his charges came through to victory by the score of 17-11. There is no one man at Annapolis who sticks closer to the ship and around whom more football traditions have grown than Paul Dashiell, a professor in the Academy. He bore for many years the burden of responsibility of Annapolis foot[Pg 199]ball. His earnest desire has been to see the Navy succeed. 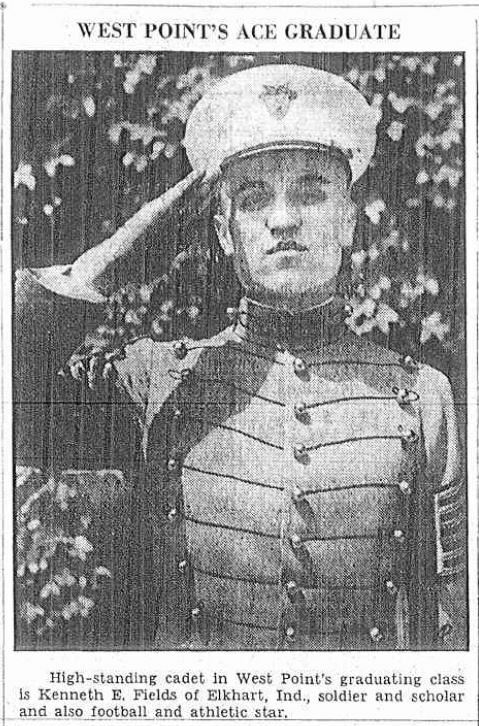 He has worked arduously, and whenever Navy men get together they speak enthusiastically of the devotion of this former Lehigh hero, official and rule maker. Players have come and gone; the call in recent years has been elsewhere, but Paul Dashiell has remained, and his interest in the game has been manifested by self-denial and hard work. 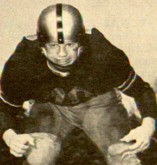 Defeat has come to him with great sadness, and there are many games of which he still feels the sting; these come to him as nightmares in his recollections of Annapolis football history. Great has been his joy in the Navy’s hour of victory. It was here at Annapolis that I learned something of the old Navy football heroes. 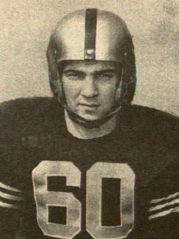 Most brilliant of all, perhaps, was Worth Bagley, a marvelous punter and great fighter. He lost his life later in the war with Spain, standing to his duty under open fire on the deck of the Winslow at Cardenas, with the utter fearlessness that was characteristic of him. I heard of the deeds on the football field of Mike Johnson, Trench, Pearson, McCormack, Cavanaugh, Reeves, McCauley, Craven, Kimball and Bookwalter. I have played against the great Navy guard Halligan. I saw developed the Navy players, Long, Chambers, Reed, Nichols and Chip Smith, who later was in charge of the Navy athletics. 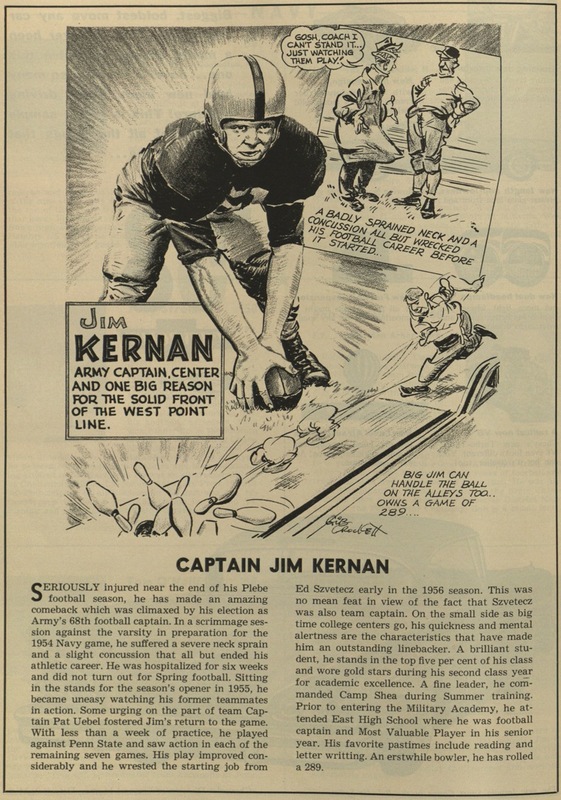 He was one of the best quarterbacks the Navy ever had. 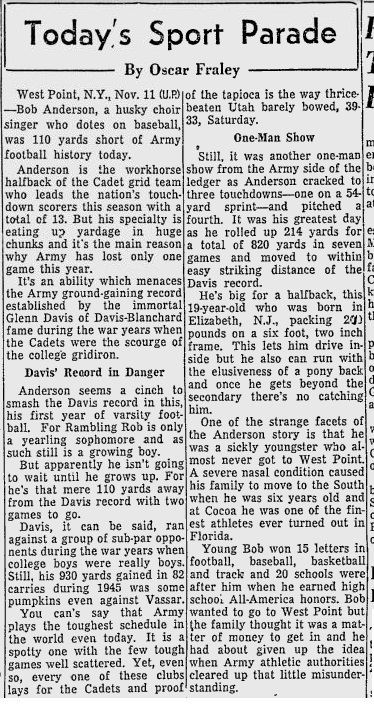 I saw Dug How[Pg 200]ard grow up from boyhood in Annapolis and develop into a Navy star; saw him later coach their teams to victory; witnessed the great playing of Dougherty, Piersol, Grady and Bill Carpenter, who is no longer on the Navy list. 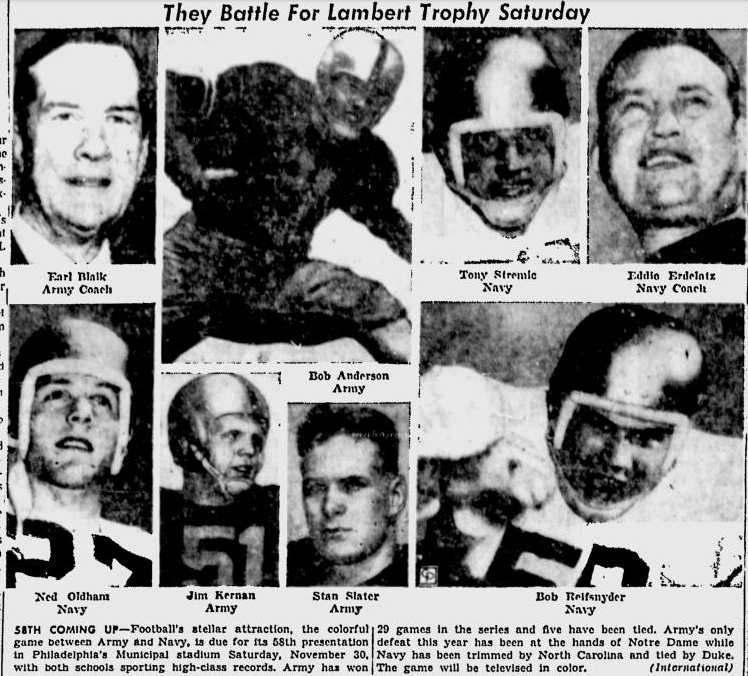 All these players, together with Norton, Northcroft, Dague, Halsey, Ingram, Douglas, Jerry Land, Babe Brown and Dalton stand out among those who have given their best in Army and Navy games. 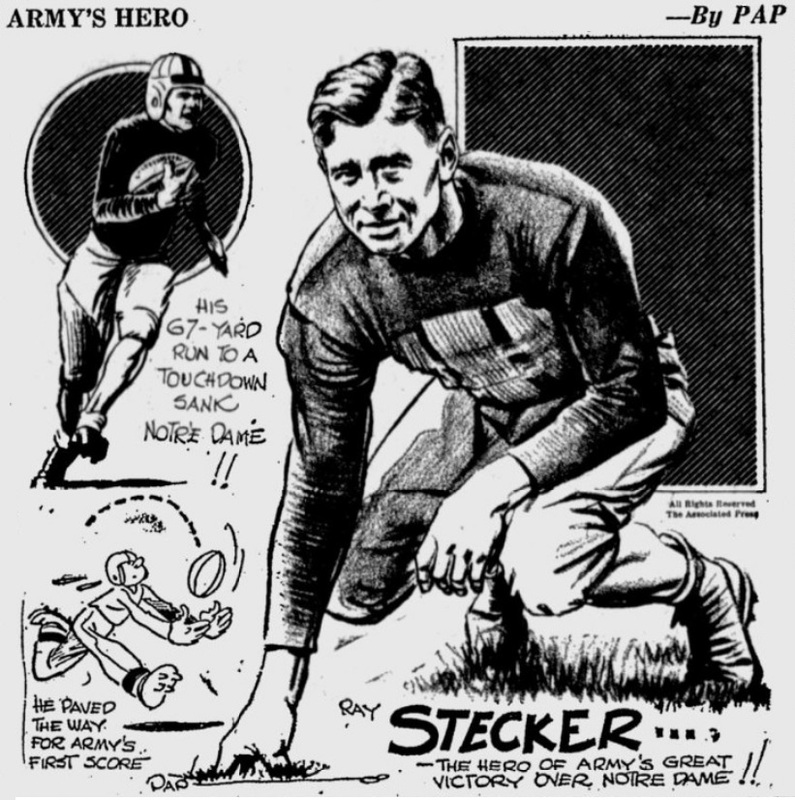 Young Nichols, who was quarterback in 1912, was a most brilliant ground gainer. He resigned from the Service early in 1913, receiving a commission in the British Army. He was wounded, but later returned to duty only to be killed shortly afterward. Another splendid man. 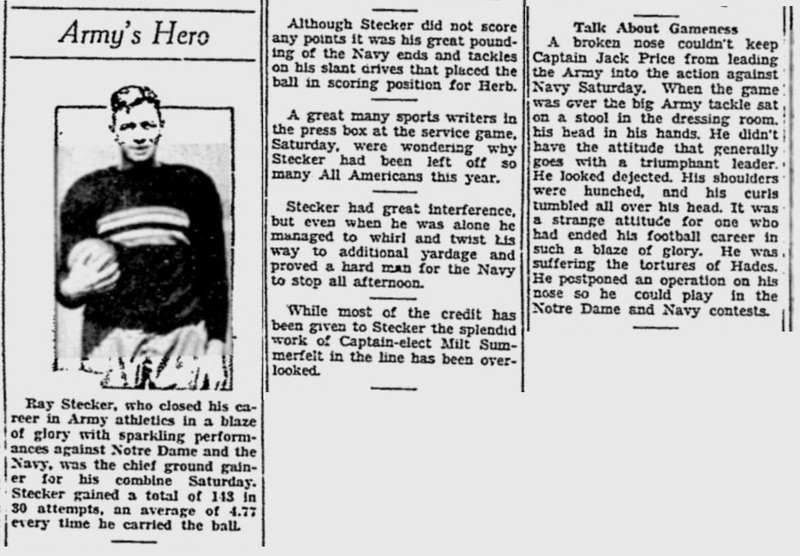 In speaking of Navy football I cannot pass over the name of W. H. Stayton, a man whose whole soul seemed to be permeated with Navy atmosphere, and who is always to be depended upon in Navy matters. 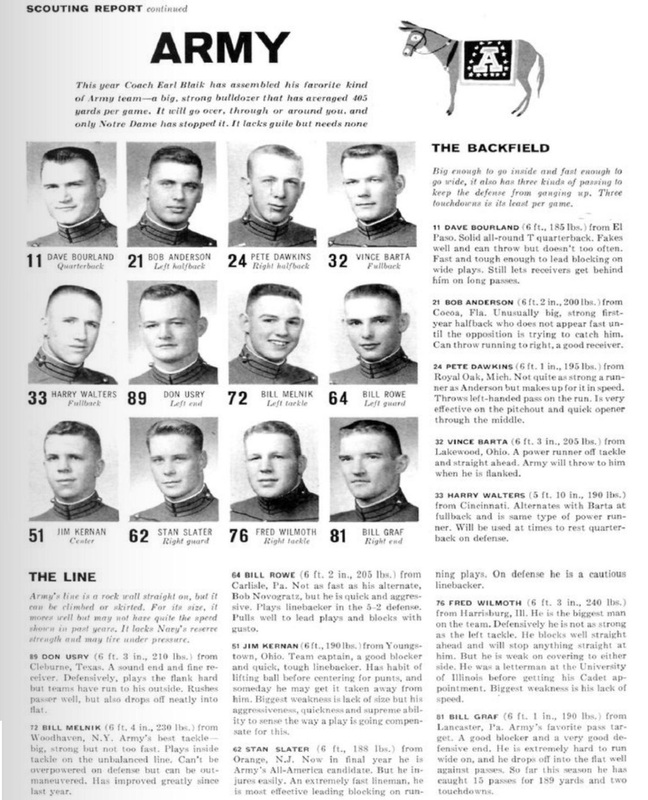 The association that I formed later in life with McDonough Craven and other loyal Navy football men gave me an opportunity to learn of Annapolis football in their day. The list of men who have been invited to coach the Navy from year to year is a long one. The ideal method of development of an undergraduate team is by a system of coaching conducted by graduates of that institution. Such alumni can best preserve the traditions, correct blunders of other years, and carry through a continuous [Pg 201]policy along lines most acceptable. Graduate coaching exclusively is nearly impossible for Navy teams, for the graduates, as officers, are stationed at far distant points, mostly on board ship. Their duties do not permit of interruption for two months. They cannot be spared from turret and bridge; from the team work so highly developed at present on shipboard. Furthermore, their absence from our country sometimes for years, keeps them out of touch with football generally, and it is impossible for them to keep up to date—hence the coaching from other institutions. 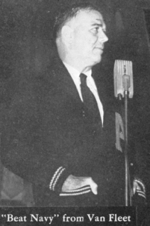 Lieutenant Frank B. Berrien was one of the early coaches and an able one. 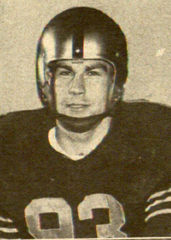 Immediately afterward Dug Howard for three years coached the team to victory. 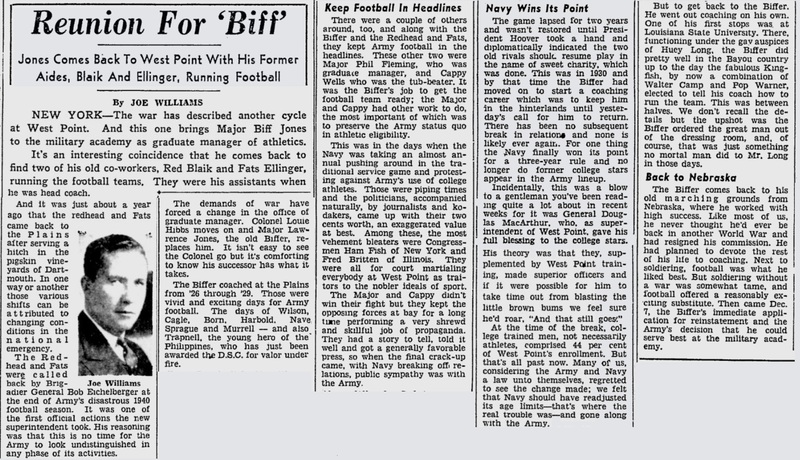 The Navy’s football future was then turned over to Jonas Ingram, with the idea of working out a purely graduate system, in the face of such serious obstacles as have already been pointed out. 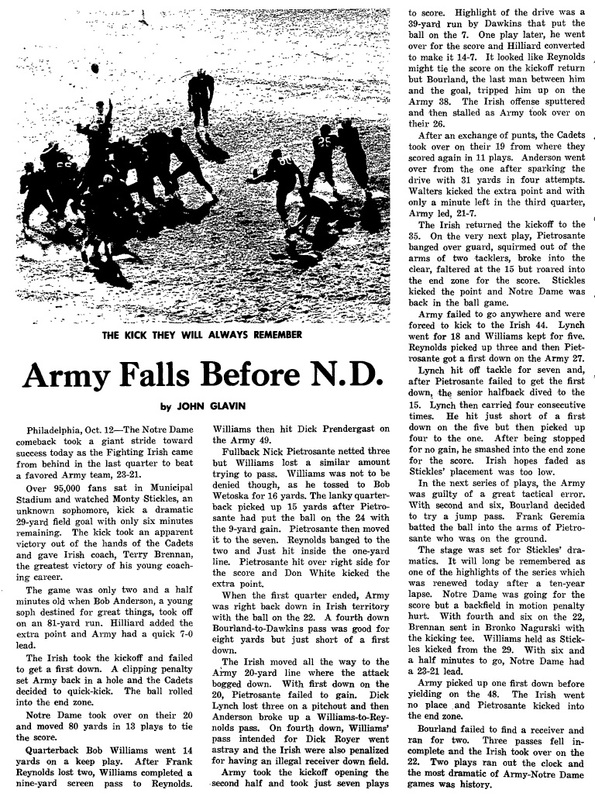 One of the nightmares of my coaching experiences was the day that the Army beat the Navy through the combined effort of the whole Army team plus the individual running of Charlie Daly. This run occurred at the very start of the second half. Doc Hillebrand and I were talking on the side lines to Evarts Wrenn, the Umpire. None of us heard the whistle blow for the starting of the second half. 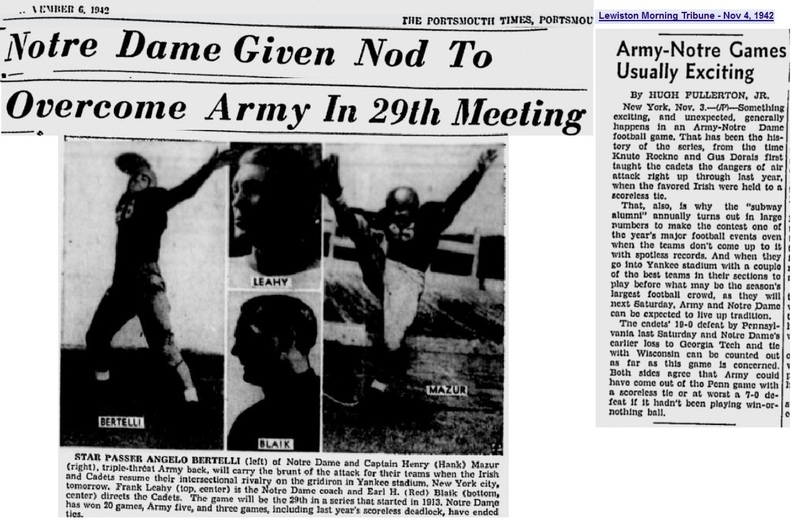 Before we knew it the Army sympathizers were on their feet cheering and we [Pg 202]saw Daly hitting it up the field, weaving through the Navy defense. 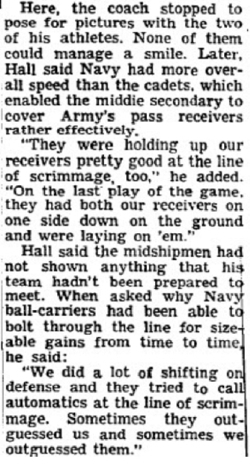 Harmon Graves, who was coaching West Point that year, has since told me that the Army coaches had drilled the team carefully in receiving the ball on a kick-off—with Daly clear back under the goal posts. 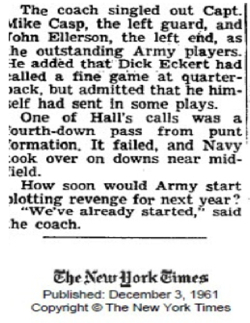 On the kick-off, the Navy did just what West Point had been trained to expect. Belknap kicked a long high one direct to Daly, and then and there began the carefully prepared advance of the Army team. 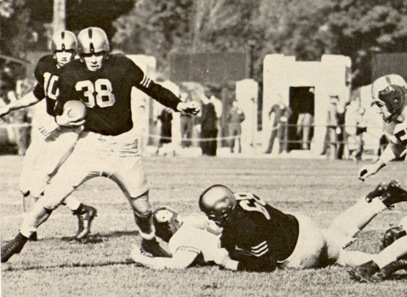 Mowing down the oncoming Navy players, the West Point forwards made it possible for clever Daly to get loose and score a touchdown after a run of nearly the entire length of the field. This game stands out in my recollection as one of the most sensational on record. 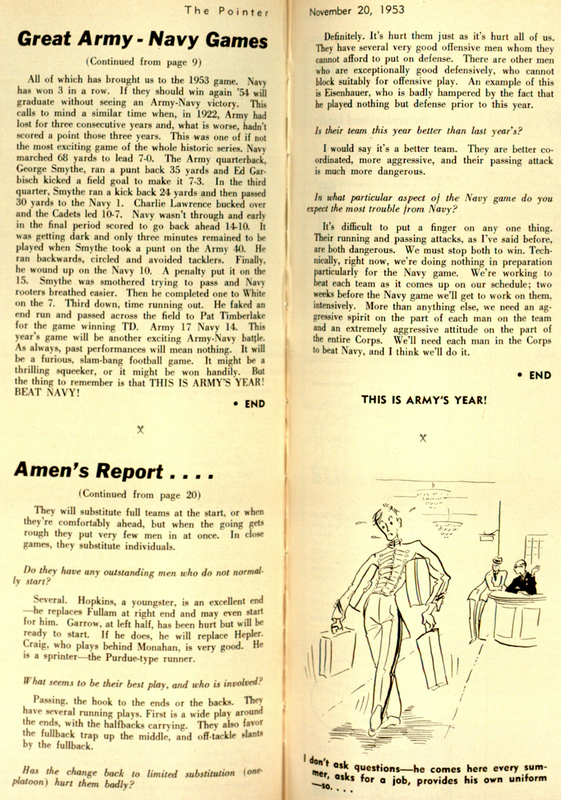 The Navy, like West Point, had had many victories, but the purpose of this book is not to record year by year the achievements of these two institutions, but rather catch their spirit, as one from without looks in upon a small portion of the busy life that is typical of these Service schools. Scattered over the seven seas are those who heard the reveille of football at Annapolis. 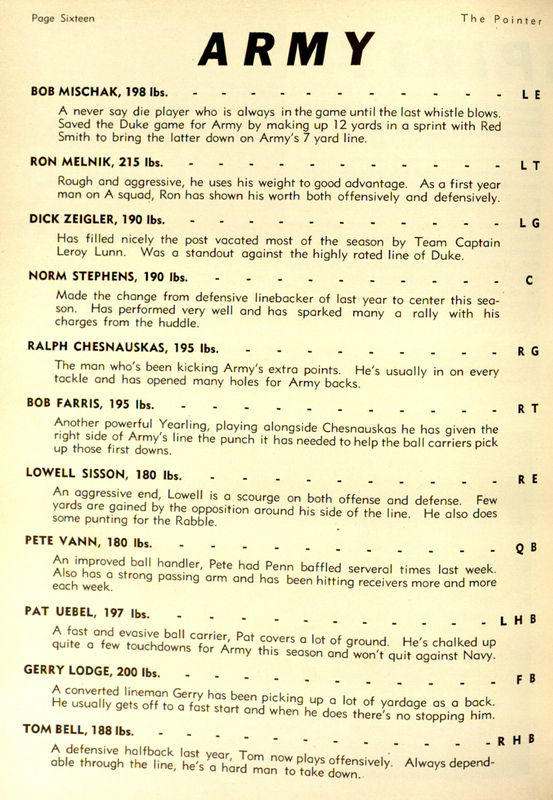 From a few old-timers let us garner their experiences and the effects of football in the Service. 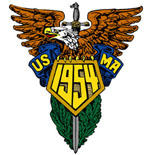 C. L. Poor, one of the veterans of the Annapolis squad, Varsity and Hustlers, has something to say concerning the effect of football upon the relationship between officers and men. “I entered the Academy in 1895. In those days athletics were not encouraged. 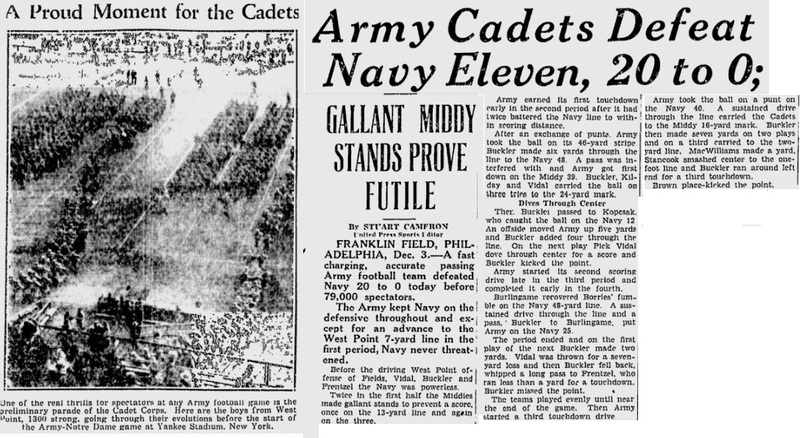 The average number of cadets was less than 200, and the entrance age was from 14 to 18—really a boys’ school. So when an occasional college team appeared, they looked like old men to us. “Match games were usually on Saturday afternoon, and all the cadets spent the forenoon at sail drill on board the Wyoming in Chesapeake Bay. I can remember spending four hours racing up and down the top gallant yard with Stone and Hayward, loosing and furling sail, and then returning to a roast beef dinner, followed by two 45-minute halves of football. 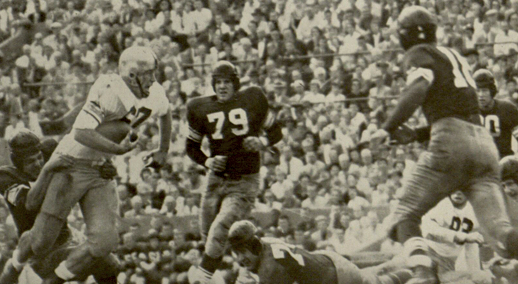 “One of our best games, as a rule, was with Johns Hopkins University. Paul Dashiell, then a Hopkins man, usually managed to smuggle one or more Poes to Annapolis with his team. We [Pg 204]knew it, but at that time we did not object because we usually beat the Hopkins team. 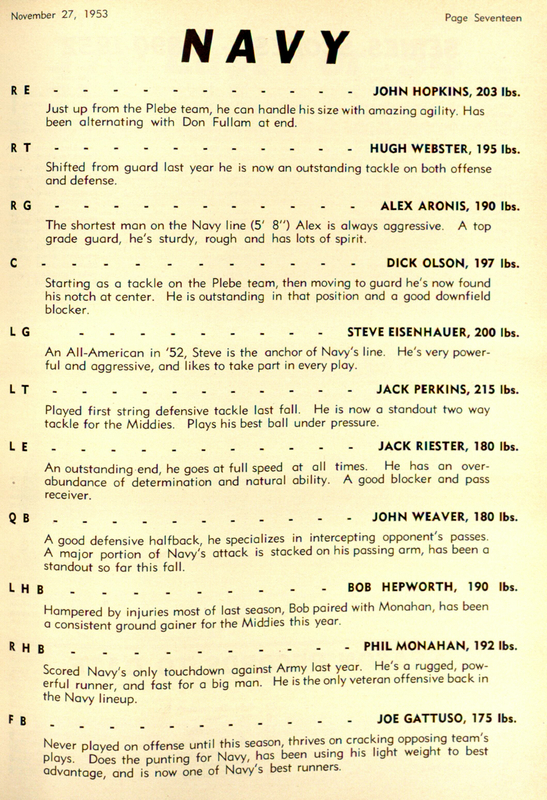 M. M. Taylor brings us down to Navy football of the early nineties. “In my day the principal quality sought was beef. Being embryo sailors we had to have nautical terms for our signals, and they made our opponents sit up and take notice. When I played halfback I remember my signals were my order relating to the foremast. For instance, ‘Fore-top-gallant clew lines and hands-by-the-halyards’ meant that I was the victim. 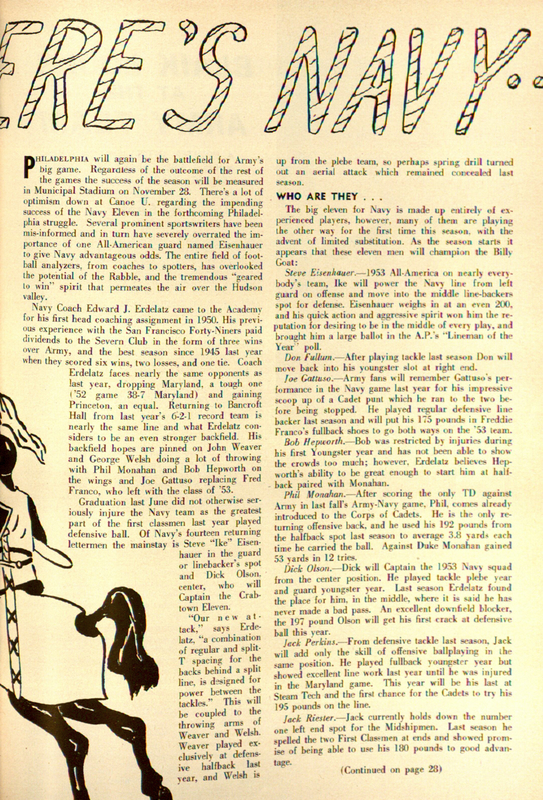 On the conclusion of the order, if the captain could not launch a play made at once, he had to lengthen his signal, and sometimes there would be a string of jargon, intelligible only to a sailor, which would take the light yard men aloft, furl the sail, and probably cast reflections on the stowage of the bunt. Anything connected with the anchor was a kick. The mainmast was consecrated to the left half, and the mizzen to the fullback. J. W. Powell, captain of the ’97 team, tells of the interim between Army-Navy games. 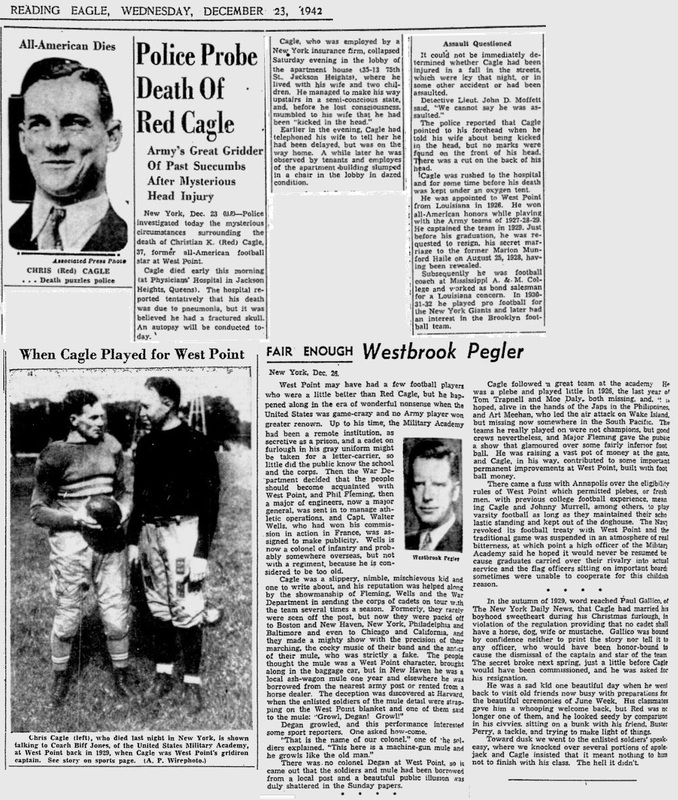 “Our head coach was Johnny Poe,” he says, “and he and Paul Dashiell took charge of the squad. Some of our good men were Rus White, Bill Tardy, Halligan and Fisher, holding over from the year before. 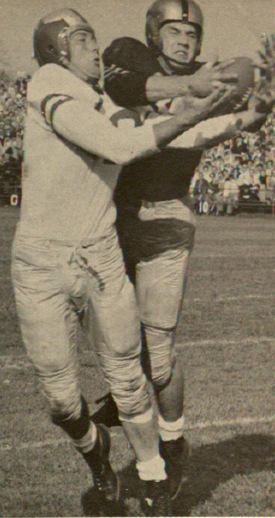 A. T. Graham and Jerry Landis in the line. A wild Irishman in the plebe class, Paddy Shea, earned one end position in short order, while A. H. McCarthy went in at the other wing. 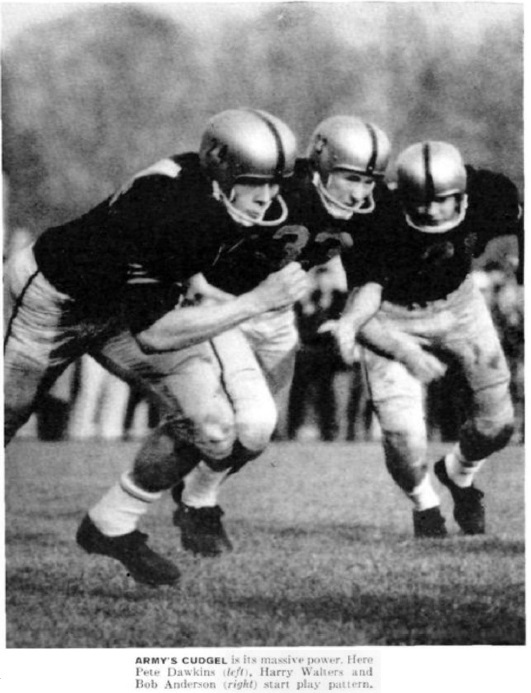 Jack Asserson, Bobby Henderson, Louis Richardson and I made up the backfield. In ’95, Princeton had developed their famous ends back system which was adopted by Johnny Poe and the game we played that year was built around this system. 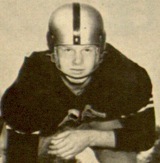 Johnny was a deadly tackler and nearly killed half the team with his system of live tackling practice. 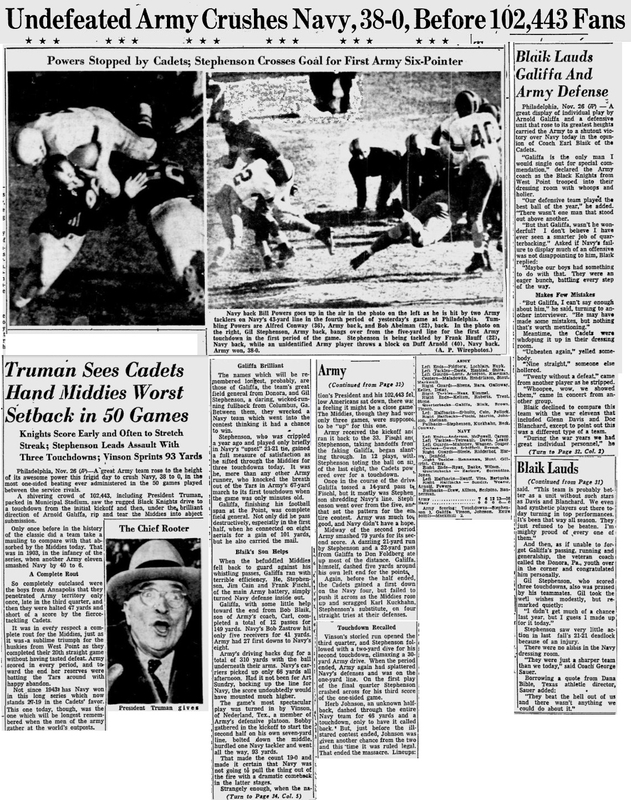 This was one of the years in which there was no Army and Navy game and our big game was the Thanksgiving Day contest with Lafayette. 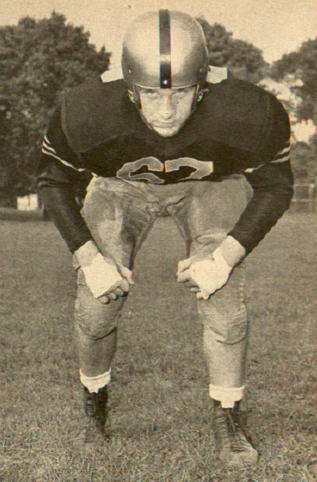 Barclay, Bray and Rinehart made Lafayette’s [Pg 206]name a terror in the football world. 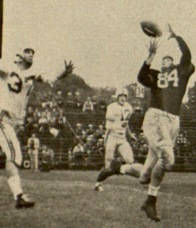 The game resulted in an 18 to 6 victory for Lafayette. 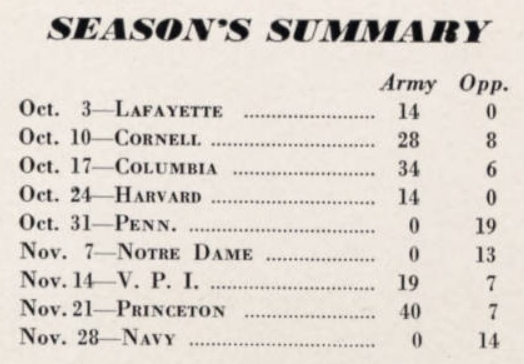 I recall a trip that the Princeton team of 1898 made to West Point. It was truly an attack upon the historical old school in a fashion de luxe. 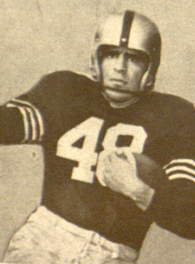 Alex Van Rensselaer, an old Princeton football captain, invited Doc Hillebrand to have the Tiger eleven meet him that Saturday morning at the Pennsylvania Ferry slip in Jersey City. En route to West Point that morning this old Princeton leader met us with his steam yacht, The May. Boyhood enthusiasm ran high as we jumped aboard. Good fellowship prevailed. We lunched on board, dressed on board. Upon our arrival at West Point we were met by the Academy representative and were driven to the football field. 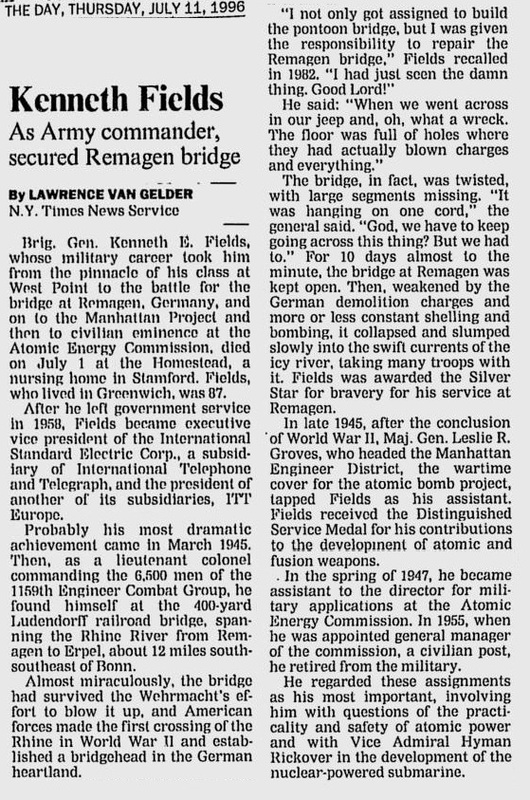 The snappy work of the Princeton team that day brought victory, and we attributed our success to the Van Rensselaer transport. Returning that night on the boat, Doc Hillebrand and Arthur Poe bribed the captain of The May to just miss connecting with the last train to Prince[Pg 207]ton, and as a worried manager sat alongside of Van Rensselaer wondering whether it were not possible to hurry the boat along a little faster, Van Rensselaer himself knew what was in Doc’s mind and so helped make it possible for us to rest at the Murray Hill Hotel over night, and not allow a railroad trip to Princeton mar the luxury of the day. I have a lot of respect for the football brains of West Point. My lot has been very happily cast with the Navy. I have generally been on the opposite side of the field. I knew the strength of their team. 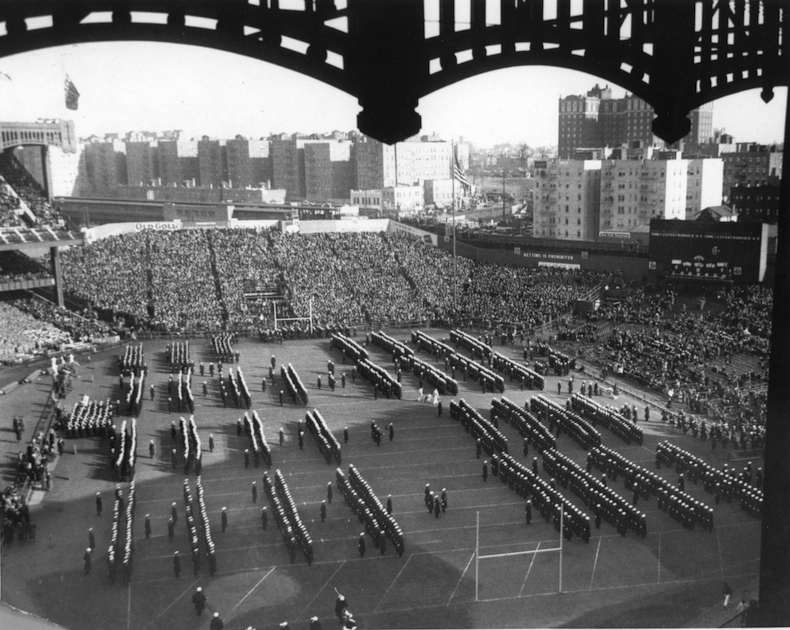 I have learned much of the spirit of the academy from their cheering at Army and Navy games. 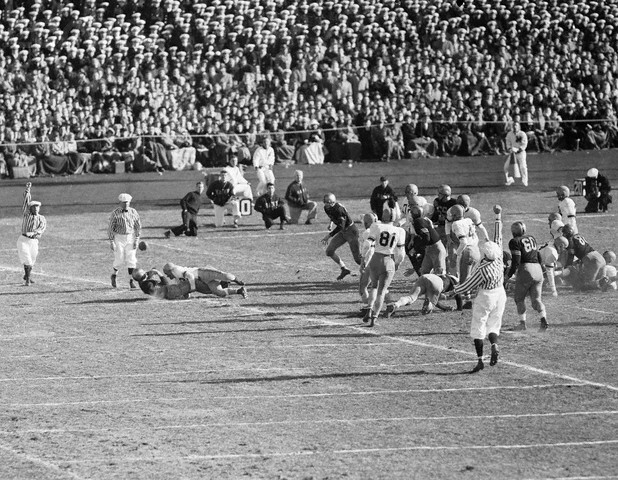 Playing against West Point our Princeton teams have always realized the hard, difficult task which confronted them, and victory was not always the reward. 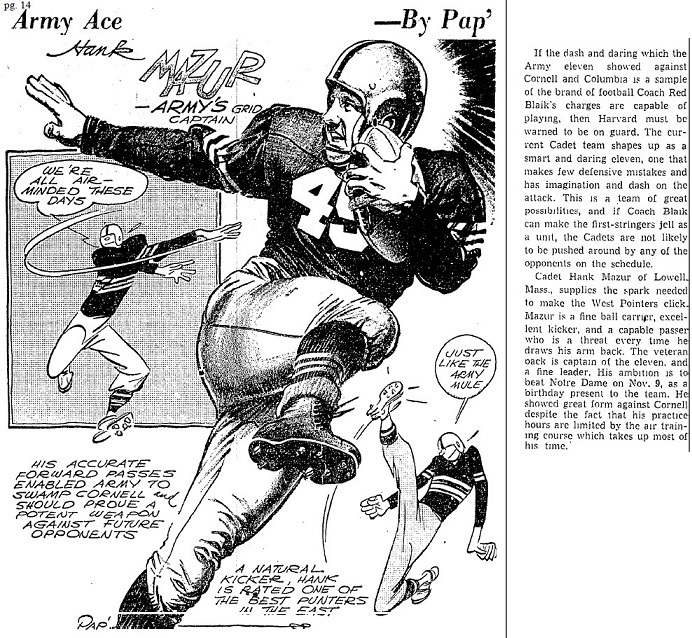 Football plays a valued part in the athletic life of West Point. 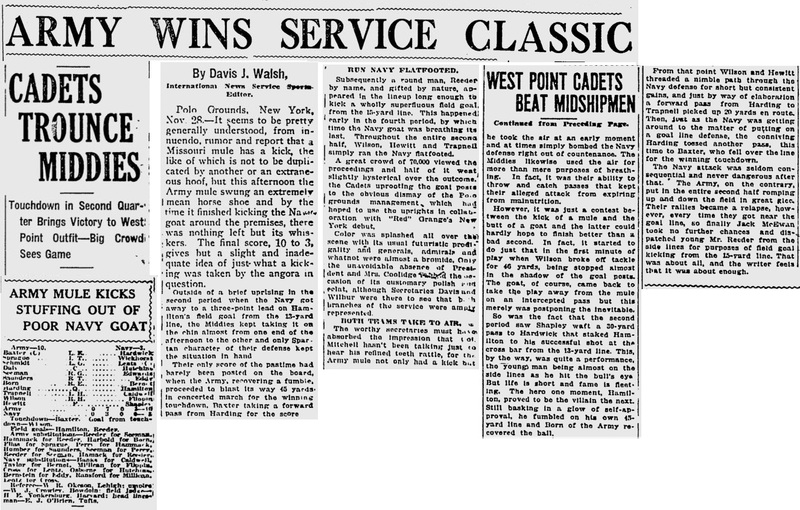 From the very first game between the Army and the Navy on the plains when the Middies were victorious, West Point set out in a thoroughly businesslike way to see that the Navy did not get the lion’s share of victories. 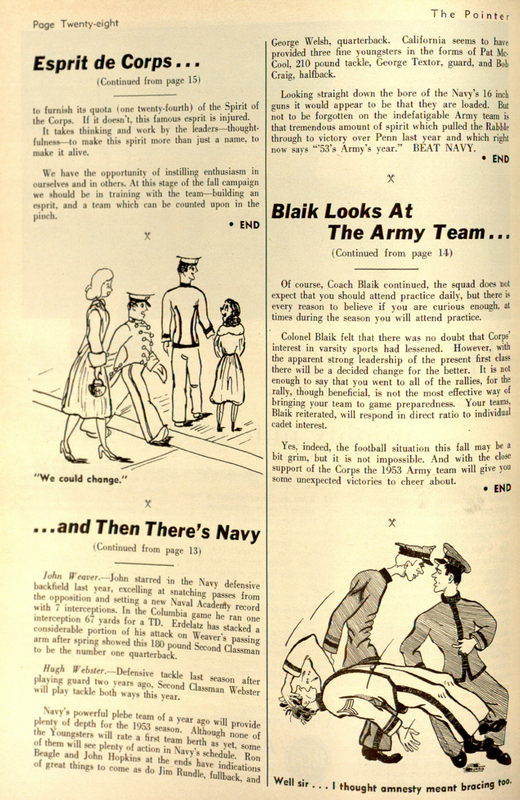 If one studies the businesslike methods of the Army Athletic Association and reads carefully the bulletins which are printed after each game, one is impressed by the attention given to details. “King, of course, stands first. 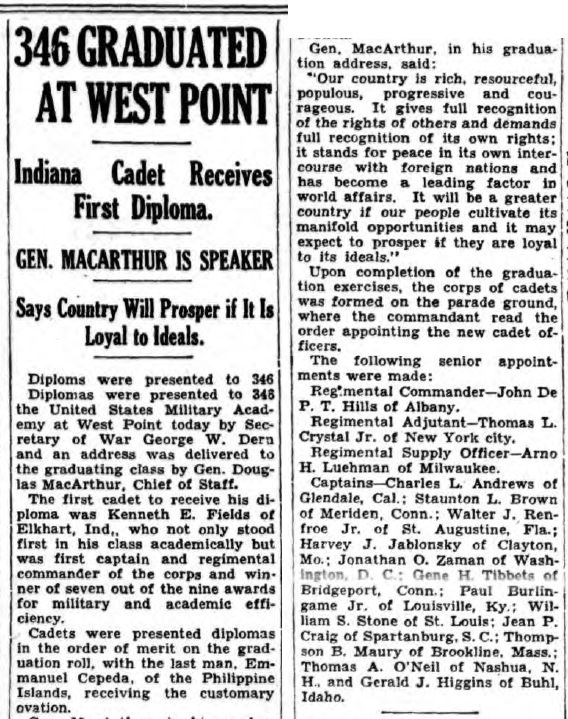 Captain for two years he brought West Point from second class directly into first. As fullback he outplayed every fullback opposed to him and stands in the judgment of all observers second only to Brooke of Pennsylvania. 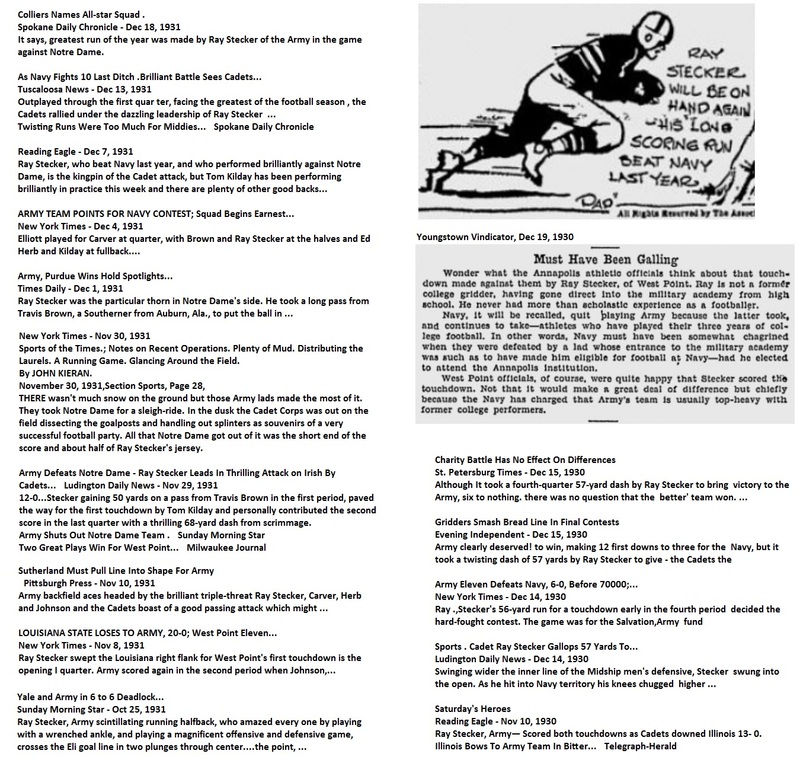 Let us read what King has to say of a period of West Point football not widely known. “I first played on the ’92 team,” he says. 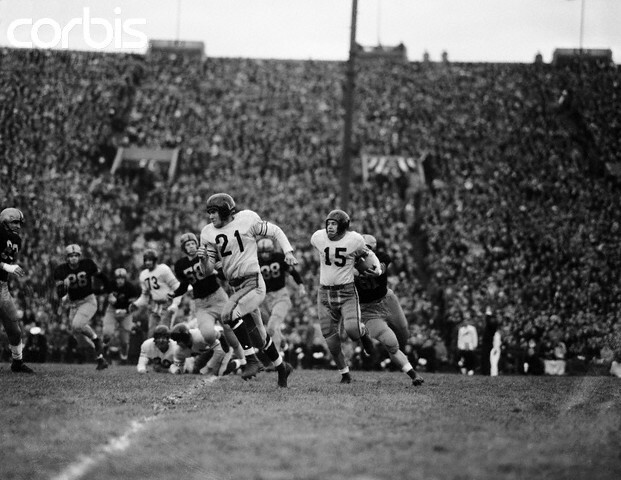 “We had two Navy games before this, but they were not much as I look back upon them. At this time we had for practice that period of Saturday afternoon after inspection. That gave us from about 3 p. m. on. We also had about fifteen minutes between dinner and the afternoon recitations, and such days as were too rainy to drill, and from 5:45 a. m., to 6:05 a. m. Later in the year when it grew too cold to drill, we had the time after about 4:15 p. m., but it became dark so early that we didn’t get much practice. We practiced signals even by moonlight. “Visiting teams used to watch us at inspection, two o’clock. 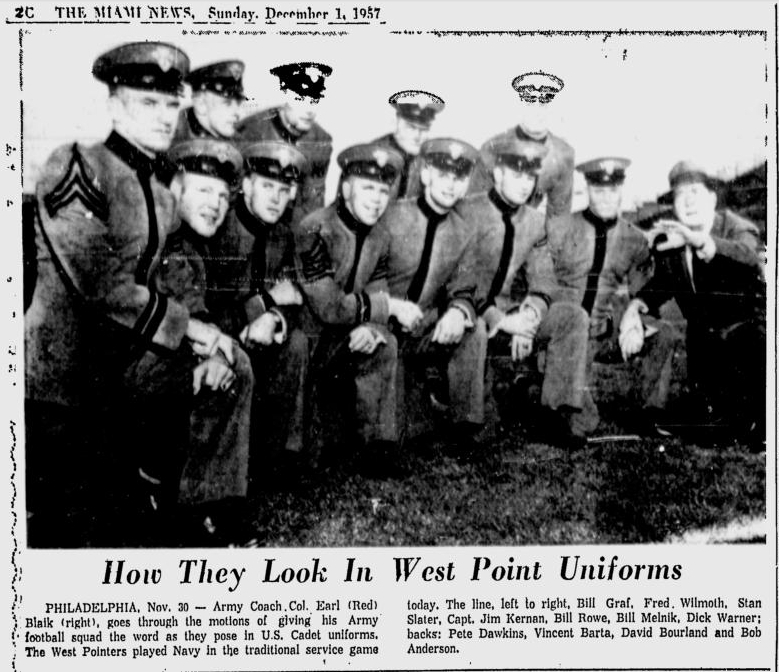 We were in tight full dress clothes, standing at attention for thirty to forty-five minutes just before the game. A fine preparation for a stiff contest. We had quite a character by the name of Stacy, a Maine boy. He was a thickset chap, husky and fast. He never knew what it was to be stopped. He would fight it [Pg 209]out to the end for every inch. 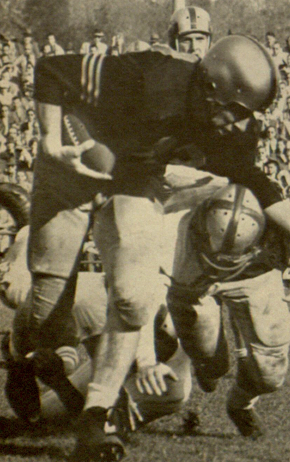 Early in one of the Yale games he broke a rib and started another, but the more it hurt, the harder he played. In a contest with an athletic club in the last non-collegiate game we ever played, the opposing right tackle was bothering us. In a scrimmage Stacy twisted the gentleman’s nose very severely and then backed away, as the man followed him, calling out to the Umpire. Stacy held his face up and took two of the nicest punches in the eyes that I ever saw. Of course, the Umpire saw it, and promptly ruled the puncher out, just as Stacy had planned. “Just before the Spanish War Stacy became ill. Orders were issued that regiments should send officers to the different cities for the purpose of recruiting. He was at this time not fit for field service, so was assigned to this duty. 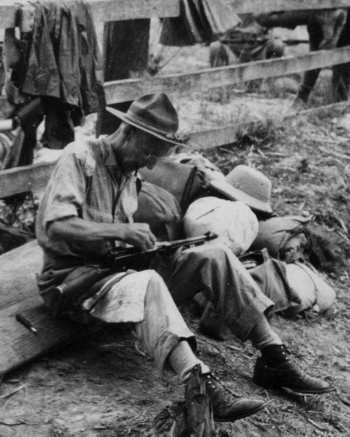 He protested so strongly that in some way he was able to join his regiment in time to go to Cuba with his men. He participated in all the work down there; and when it was over, even he had to give in. He was sent to Montauk Point in very bad shape. He rallied for a time and obtained sick leave. He went to his old home in Maine, where he died. It was his old football grit that kept him going in Cuba until the fighting was over. 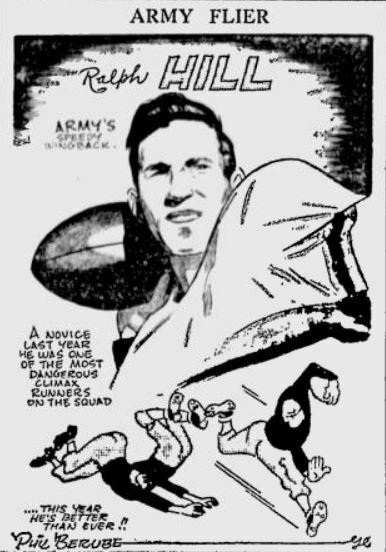 “No mention of West Point’s football would be complete without the name of Dennis Michie. He is usually referred to as the Father of Foot[Pg 210]ball at the Academy. He was captain of the first two teams we ever had. He played throughout the Navy game in ’91 with ten boils on his back and neck. 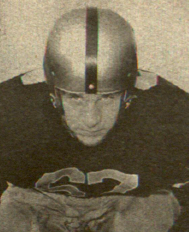 He was a backfield man and one of West Point’s main line backers. He was most popular as a cadet and officer and was killed in action at San Juan, Cuba. “One of the longest runs when both yards and time are considered ever pulled off on a football field, was made by Duncan, ’95, in our Princeton game of ’93. 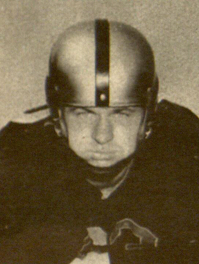 Duncan got the ball on his 5-yard line on a fumble, and was well under way before he was discovered. Lott, ’96, later a captain of Cavalry, followed Duncan to interfere from behind. 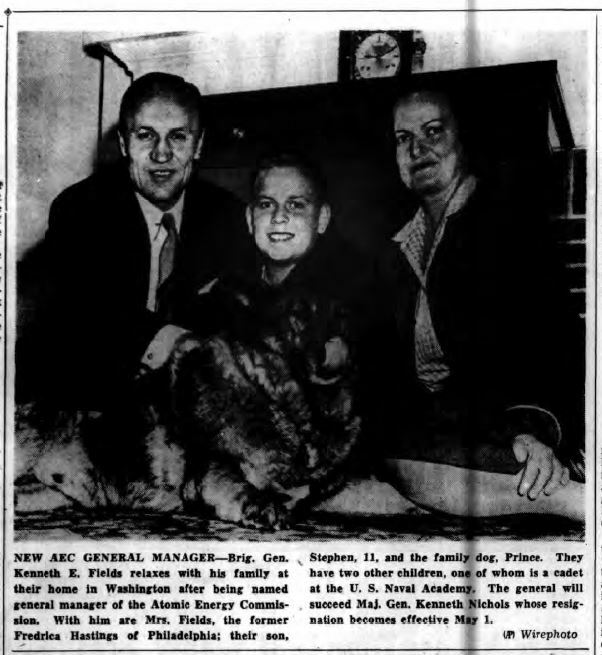 The only Princeton man who sensed trouble was Doggy Trenchard. He set sail in pursuit. 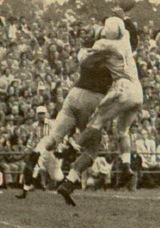 He soon caught up with Lott and would have caught Duncan, but for the latter’s interference. Duncan finally scored the touchdown, having made the 105 yards in what would have been fast time for a Wefers. 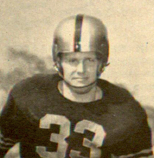 Harmon Graves of Yale is a coach who has contributed much to West Point’s football. In a recent talk with Harmon Graves he showed me a beautifully engraved watch presented to him by the Cadet Corps of West Point, a treasure prized. 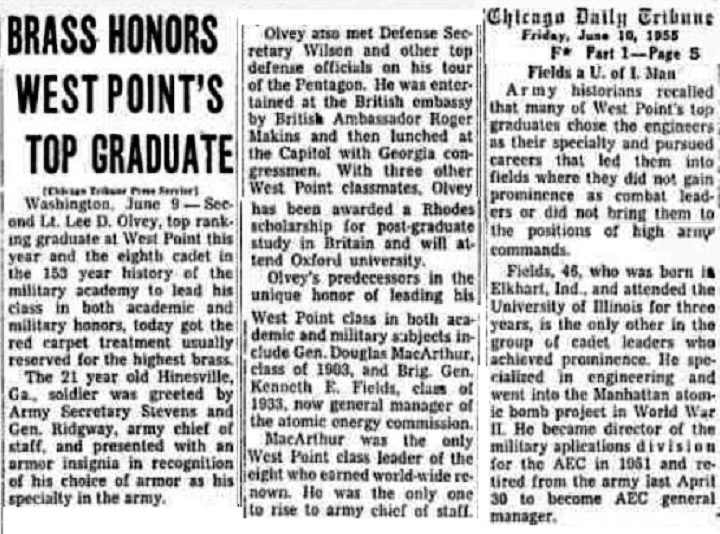 “Every civilian who has the privilege of working with the officers and cadets at West Point to accomplish some worthy object comes away a far better man than when he went there. I was fortunate enough to be asked by them to help in the establishment of football at the Academy and for many years I gave the best I had and still feel greatly their debtor. 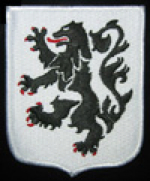 “At West Point amateur sport flourishes in its perfection, and a very high standard of accomplishment has been attained in football. 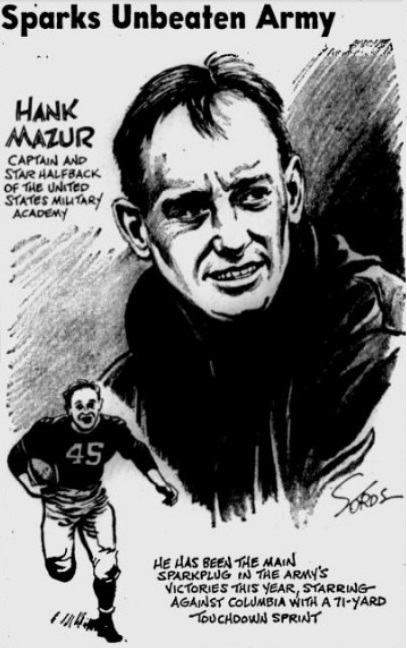 There are no cross-cuts to the kind of football success West Point has worked for: it is all a question of merit based on competency, accuracy and fearless execution. 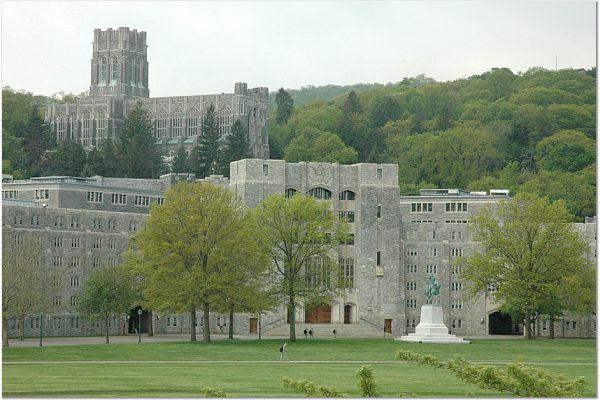 Those of us who have had the privilege of assisting in the development of West Point football have learned much of real value from the officers and cadets about the game and [Pg 212]what really counts in the make-up of a successful team. 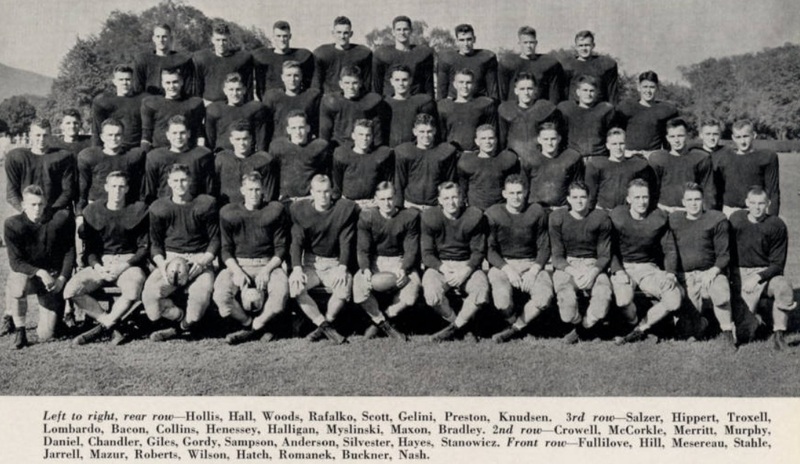 It is fair to say that West Point has contributed a great deal to football generally and has, in spite of many necessary time restrictions, turned out some of the best teams and players in the last fifteen years. 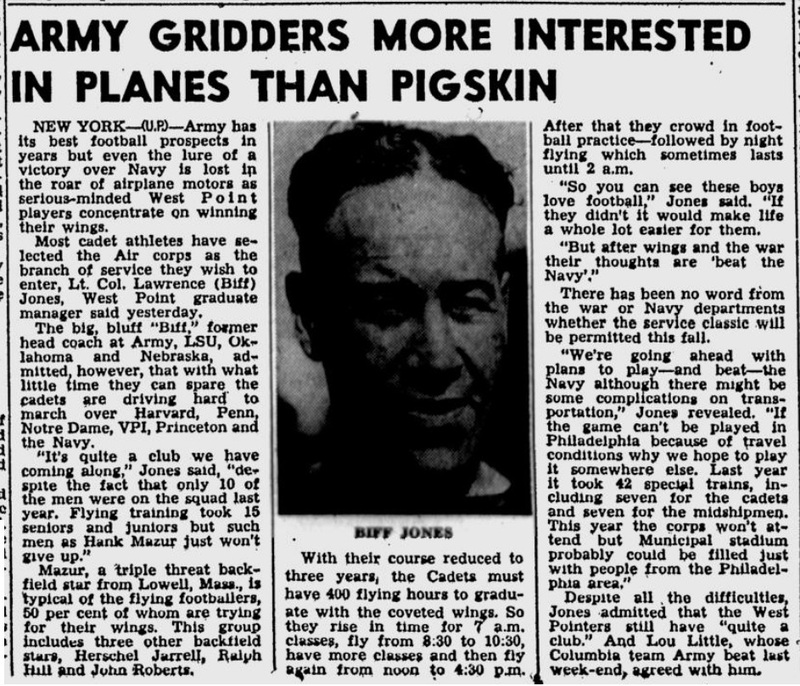 “The greatest credit is due to the Army Officers Athletic Association, which, through its football representatives, started right and then pursued a sound policy which has placed football at West Point on a firm basis, becoming the standing and dignity of the institution. 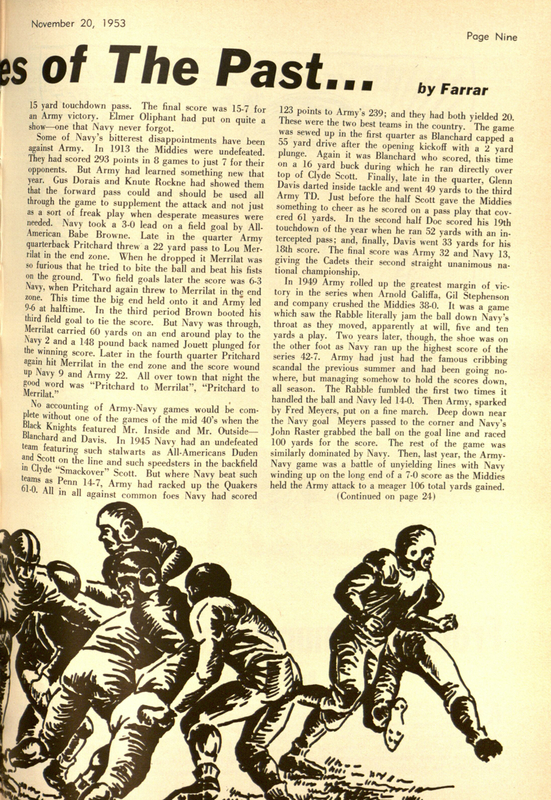 “There have been many interesting and amusing incidents in connection with football at West Point which help to make up the tradition of the game there and are many times repeated at any gathering of officers and cadets. 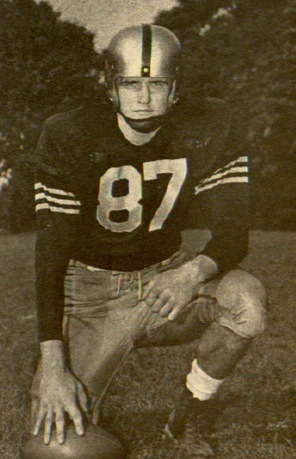 I well remember when Daly, the former Harvard Captain, modestly took his place as a plebe candidate for the team and sat in the front row on the floor of the gymnasium when I explained to the squad, and illustrated by the use of a blackboard, what he and every one else there knew was the then Yale defense. 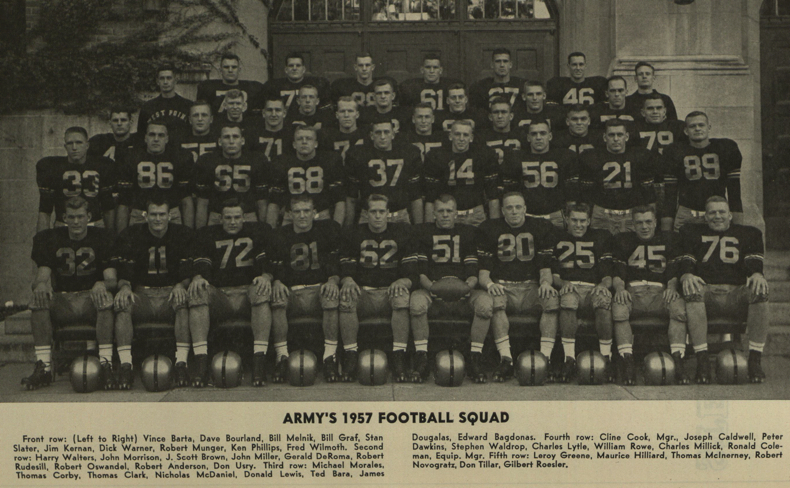 There was, perhaps, the suggestion of a smile all around when I began by saying that from then on we were gathered there for West Point and to make its team a success that season and not for the benefit of Harvard or Yale. He told me afterwards that he had never understood the defense as I had explained it. 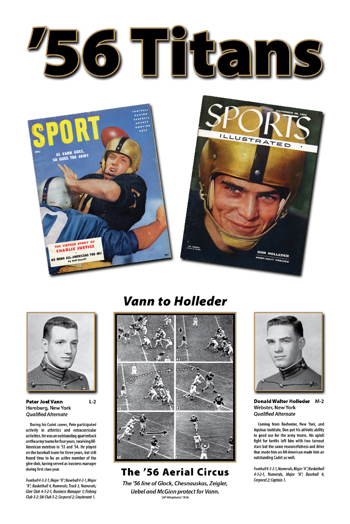 He mastered it and believed in it, as he won and [Pg 213]kept his place on the team and learned some things from West Point football,—as we all did. 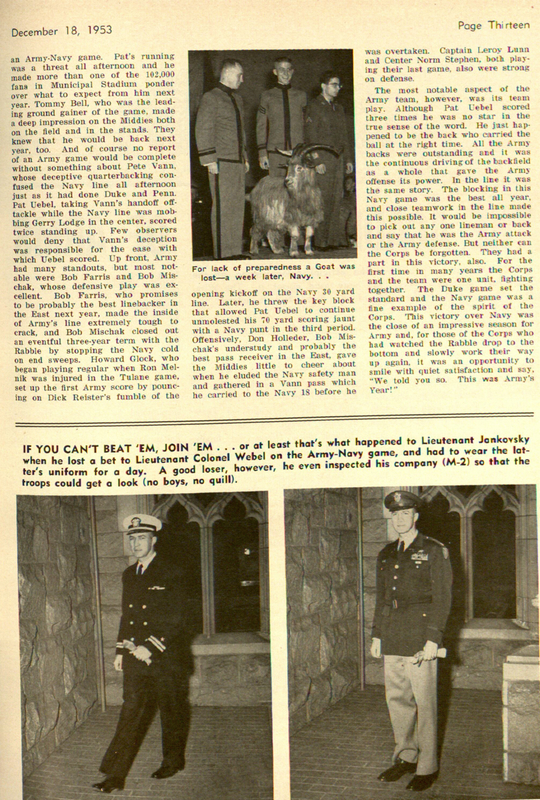 “The rivalry with the Navy is wholesome and intense, as it should be. My friend, Paul Dashiell, who fully shares that feeling, has much to do with the success of the Navy team, and the development of football at the Naval Academy. 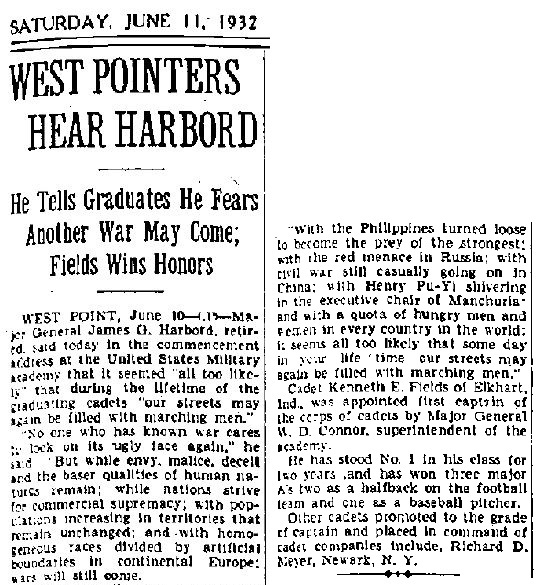 After a West Point victory at Philadelphia, he came to the West Point dressing room and offered his congratulations. As I took his hand, I noted that tears were in his eyes and that his voice shook. The next year the Navy won and I returned the call. I was feeling rather grim, but when I found him surrounded by the happy Navy team, he was crying again and hardly smiled when I offered my congratulation, and told him that it really made no difference which team won for he cried anyway. Siding with the Navy has enabled me to know West Point’s strength. 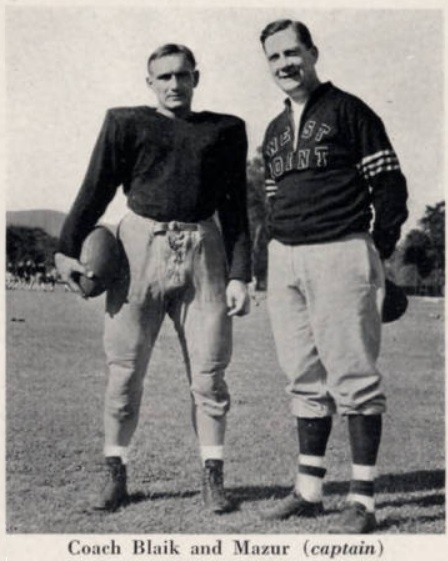 Any mention of West Point’s football would be incomplete without the names of some officers who have not only safeguarded the game at West Point, but have been the able representatives of the Army’s football during their service there. Such men are, Richmond P. Davis, Palmer E. Pierce, and W. R. Richardson. 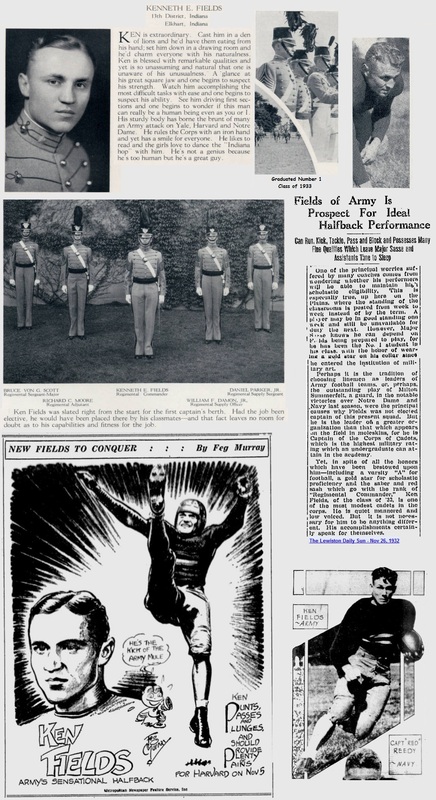 If there is any one man who has permanently influenced football at West Point that man is H. J. Koehler, for years Master of the Sword at the Academy. 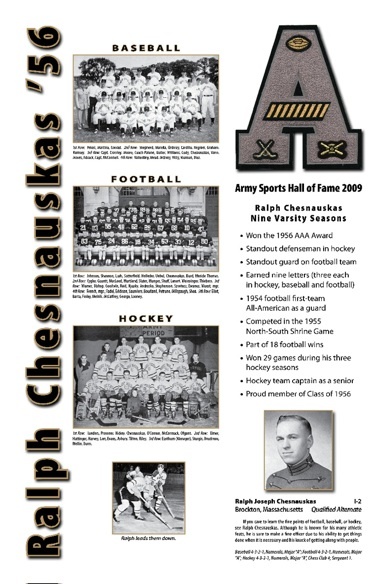 Under his active coaching some of the Army’s finest players were developed. In recent years he has not been a member of the coaching staff, but he none the less never loses touch with the team and his advice concerning men and methods is always eagerly sought. By virtue of long experience at the Academy and because of an aptitude for analysis of the game itself he has been invaluable in harmonizing practice and play with peculiar local conditions. Any time the stranger seeks to delve either into the history or the constructive coaching of the game at the Academy, the younger men, as well as the older, will always answer your questions by saying “Go ask Koehler.” Always a hard worker and serious thinker, he is apt to give [Pg 215]an almost nightly demonstration during the season of the foundation principles of the game. 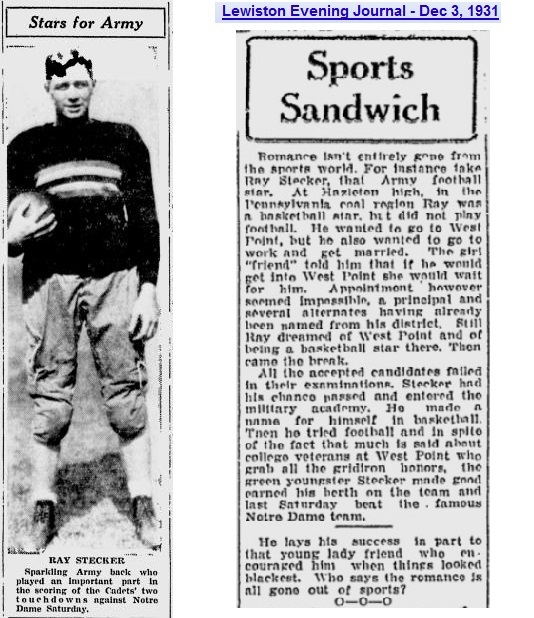 Not only West Pointers, but also Yale and Princeton men, who had to face the elevens under Koehler’s coaching will remember Romeyn, who, had he been kicking in the days of Felton, Mahan and the other long distance artillerists, might well have held his own, in the opinion of Army men. Nesbitt, Waldron and Scales were among the other really brilliant players whom Koehler developed. 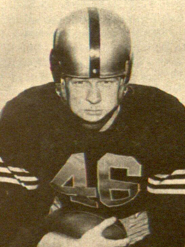 He was in charge of some of the teams that played the hardest schedules in the history of West Point football. One year the cadets met Harvard, Yale, Princeton, Columbia, Syracuse and Penn State. Surely this was a season’s work calculated to develop remarkable men, or break them in the making. 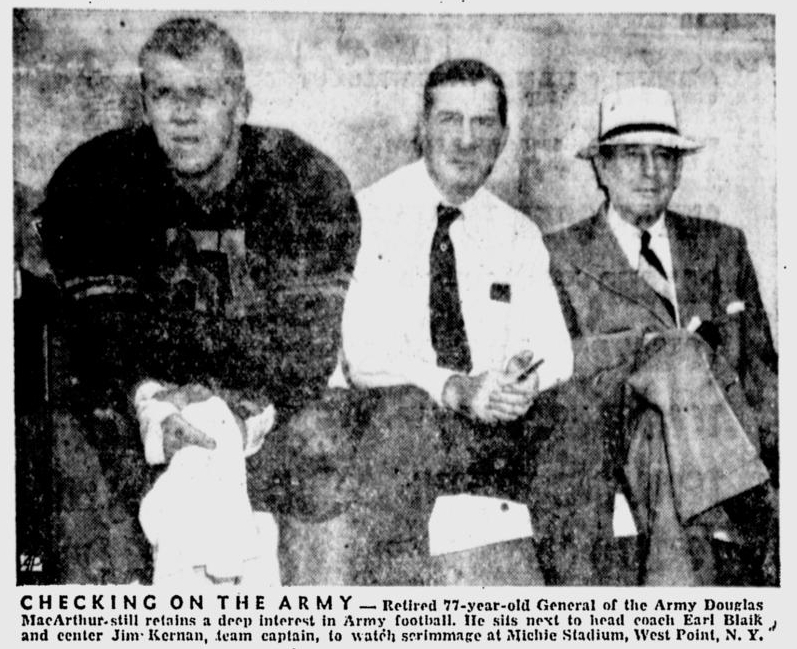 Bettison, center, King Boyers at guard, and Bunker at tackle and half, were among the splendid players who survived this trial by fire. Casad, Clark and Phillips made up a backfield that would have been a credit to any of the colleges. 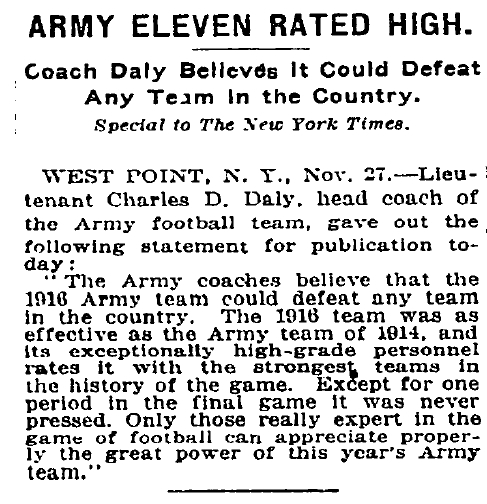 Soon, however, the Army strength was greatly to be augmented by the acquisition of Charles Dudley Daly, fresh from four years of football at Harvard. 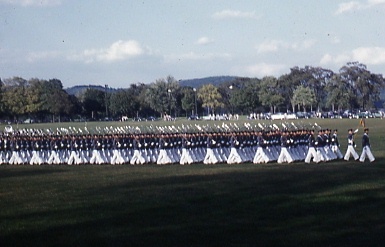 Reputations made elsewhere do not count for much at West Point. 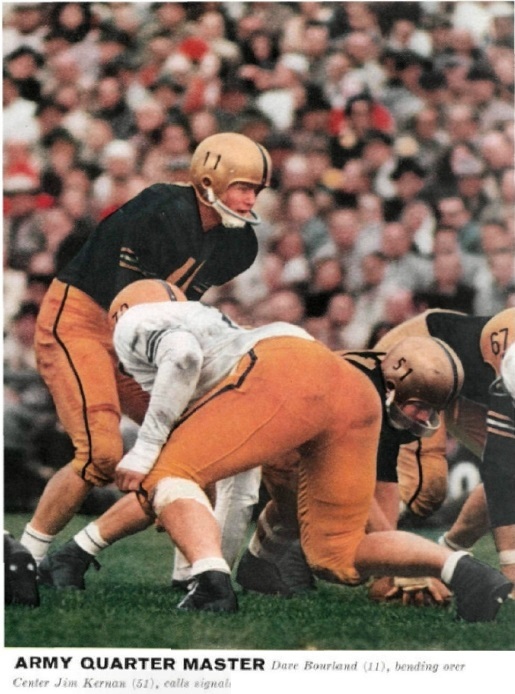 The coaches were glad to have Plebe Daly come out for the squad, but they knew and he knew quite as well as they, that there are no short cuts to the [Pg 216]big “A.” Now began a remarkable demonstration of football genius. 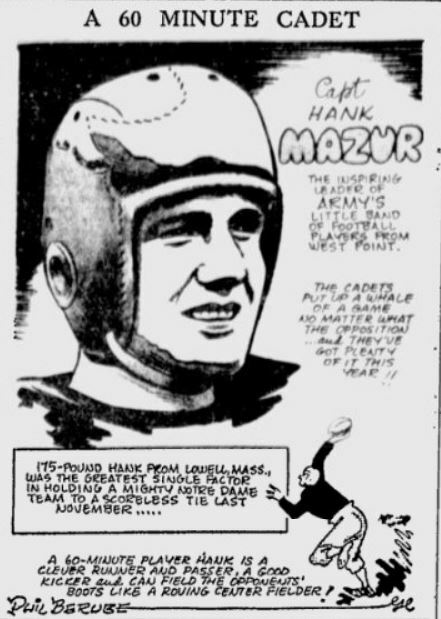 Not only did the former Harvard Captain make the team, but his aid in coaching was also eagerly sought. An unusual move this, but a tribute to the new man. It was in Daly’s first year that a huge Southerner, with a pleasant drawl, turned up in the plebe class. 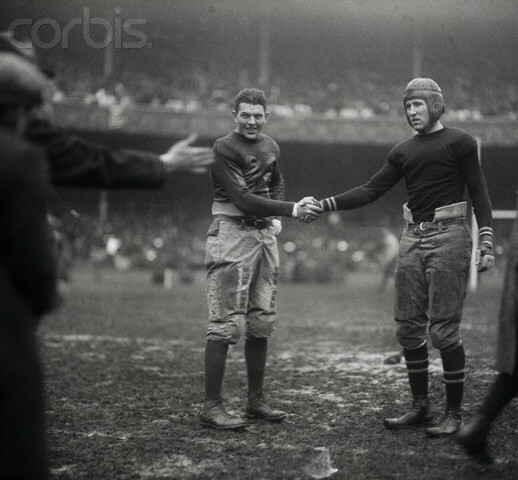 It was a foregone conclusion almost on sight that Ernest, better known to football men throughout the country as Pot Graves, would make the Eleven. 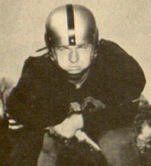 He not only played the game almost flawlessly from the start, but he made so thorough a study of line play in general that his system, even down to the most intimate details of face to face coaching filed away for all time in that secret library of football methods at West Point, has come to be known as Graves’ Bible. Daly, still with that ineradicable love for his own Alma Mater, lent a page or two from this tome to Harvard, and even the author appeared in person on Soldiers’ Field. 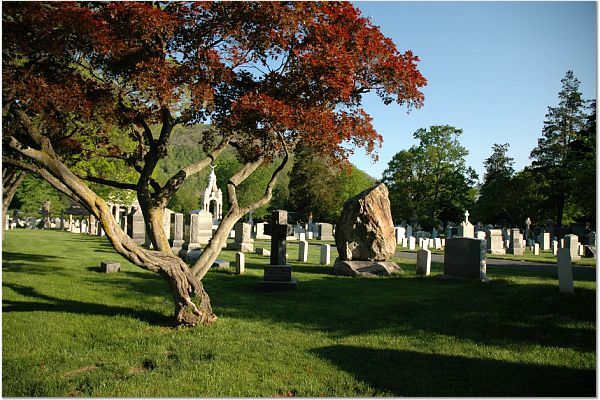 The manner in which Graves made personal demonstration of his teachings will not soon be forgotten by the Harvard men who had to face Pot Graves. A story is told of Graves’ impatience with the members of a little luncheon party, who in the course of an argument on the new football, were getting away from the fundamentals. Rising and stepping over to the window of the Officers’ Club, he said, with a sleepy smile: “Come here a minute, you fellows,” and, pointing down to the roadway, added, “there’s my team.” Looking out of the window the other members of the party saw a huge steam roller snorting and puffing up the hill. 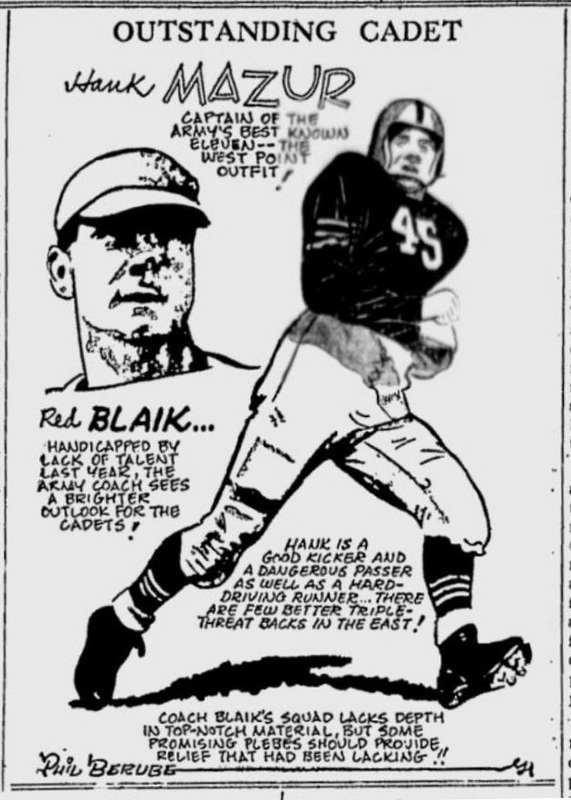 Among the men who played football with Graves and were indeed of his type, were Doe and Bunker. 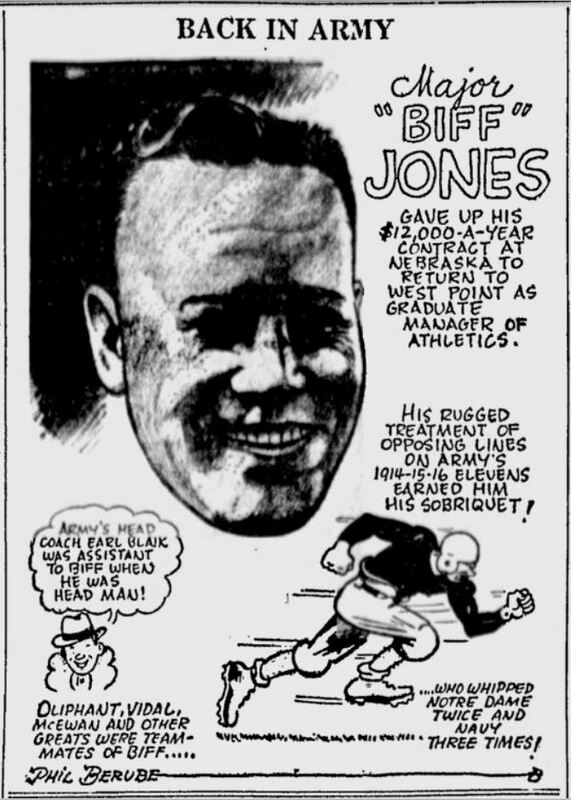 Like Graves, Bunker in spite of his great weight, was fast enough to play in the backfield in those years when Army elevens were relying so much upon terrific power. Those [Pg 219]were the days when substitutes had very little opportunity. 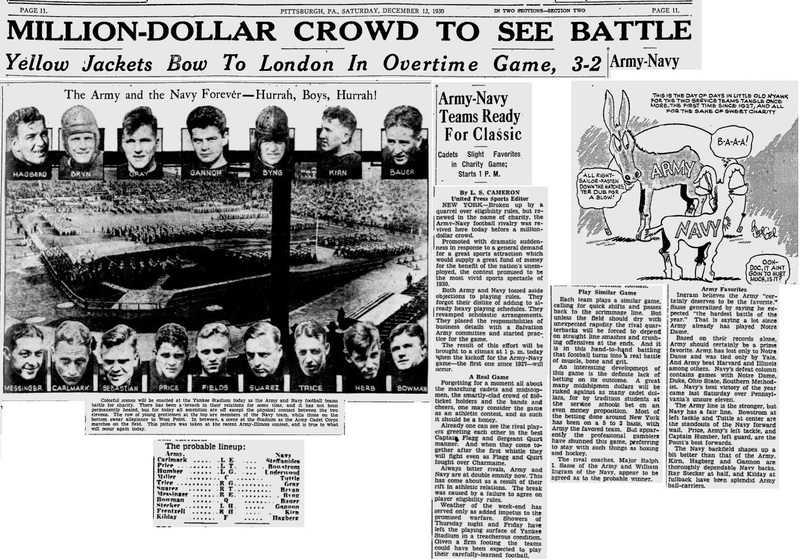 In the final Navy game of 1902 the same eleven men played for the Army from start to finish. 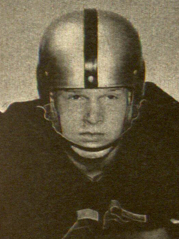 In this period of Army football other first-class men were developed, notably Torney, a remarkable back, Thompson, a guard, and Tom Hammond, who was later to make a reputation as an end coach. 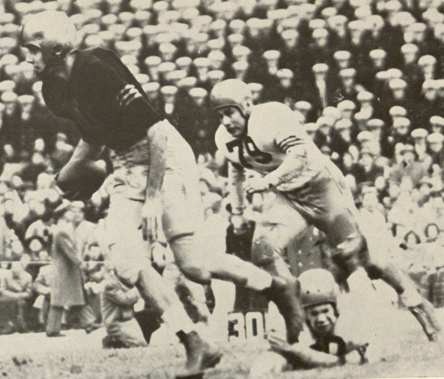 Bunker was still with this aggregation, an eleven that marched fifty yards for a touchdown in fifteen plays against the midshipmen. 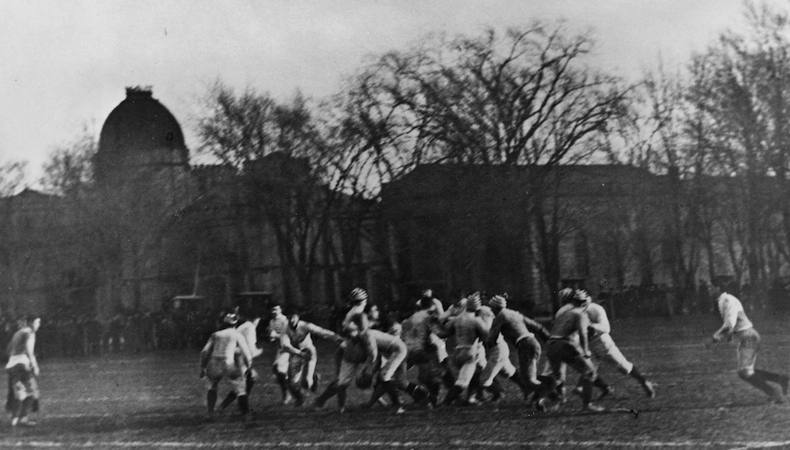 The Army was among the early Eastern teams to test Eastern football methods against those of the West, the Cadets defeating a team from the University of Chicago on the plains. 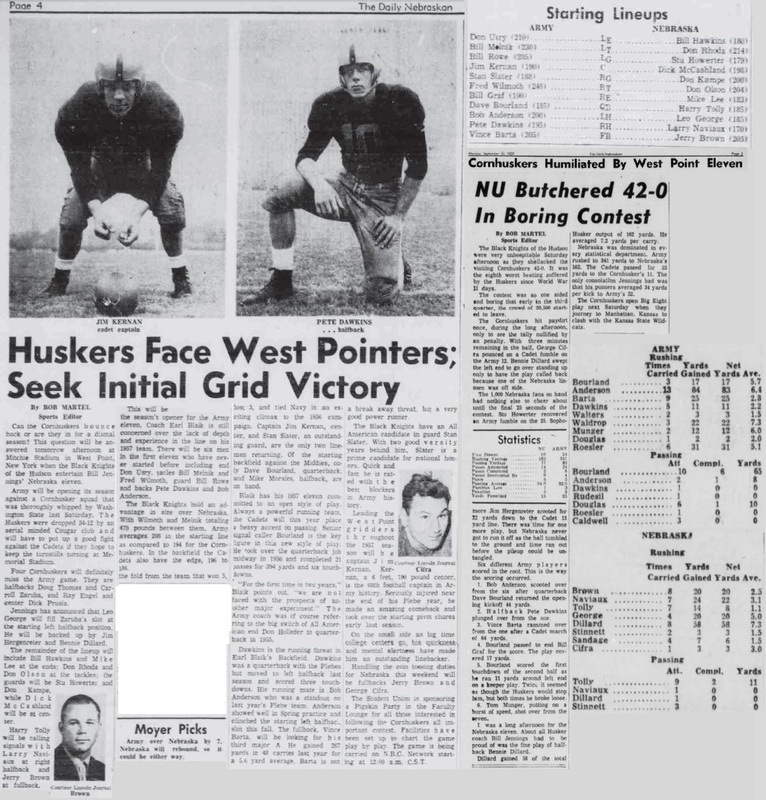 In this lineup was A. C. Tipton, at center, to whom belongs the honor of forcing the Rules Committee to change the code in one particular in order to stop a maneuver which he invented while in midcareer in a big game. No one will ever forget how, when chasing a loose ball and realizing that he had no chance to pick it up, he kicked it again and again until it crossed the final chalk mark where he fell on it for a touchdown. Tipton was something of a wrestler too, [Pg 220]as a certain Japanese expert in the art of Jiu-jitsu can testify and indeed did testify on the spot after the doctors had brought him too. 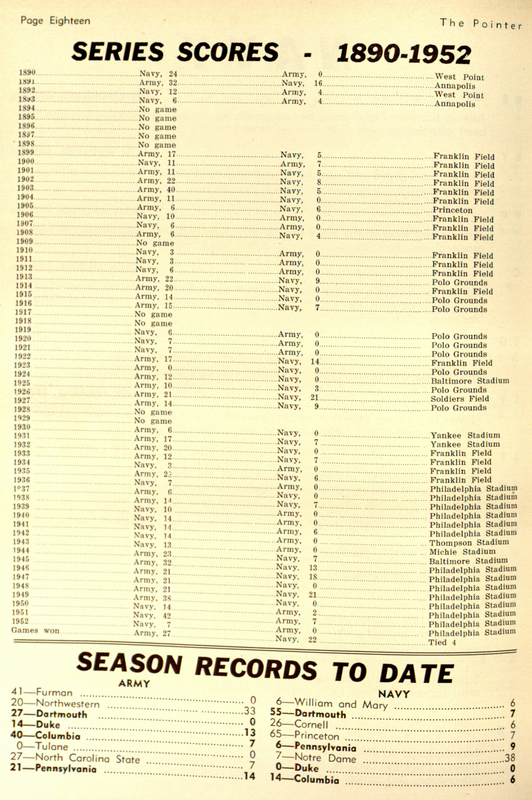 There was no lowering of the standards in the succeeding years, which saw the development of players like Hackett, Prince, Farnsworth and Davis. 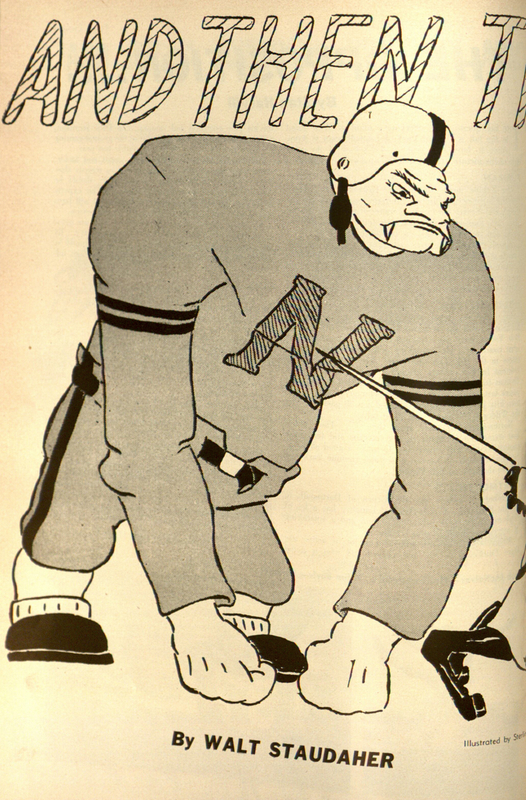 Those years too saw the rise of such wonderful forwards as W. W. (Red) Erwin and that huge man from Alaska, D. D. Pullen. 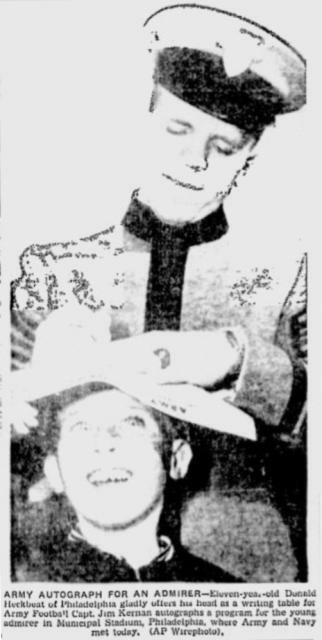 Coming now to more recent times, the coaching was turned over to H. M. Nelly, assisted by Joseph W. Beacham, fresh from chasing the little brown brother in the Philippines. 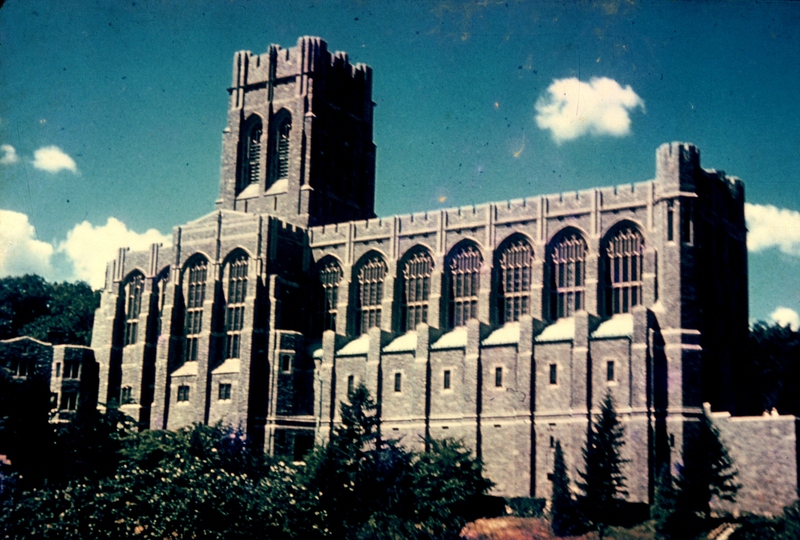 Beacham had made a great reputation at Cornell, and there was evidence that he had kept up with the game at least in the matter of strategic possibilities, even while in the tangled jungle of Luzon. He brought with him even more than that—an uncanny ability to see through the machinery of the team and pick out its human qualities, upon which he never neglected to play. There have been few coaches closer to his men than Joe. 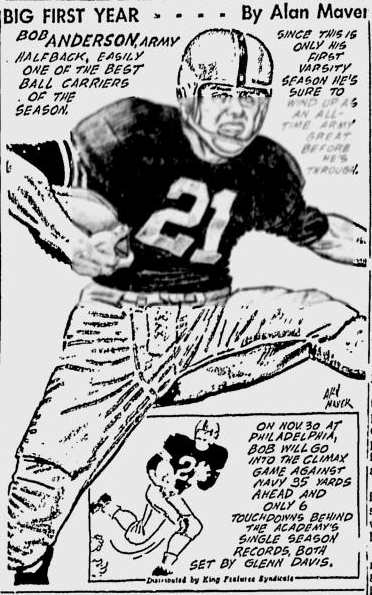 Whenever I talk football with Joe Beacham he never forgets to mention Vaughn Cooper, to whom he gives a large share of the credit for the good work of his elevens. Cooper was of the quiet type, whose specialty was defense. These two made a great team. 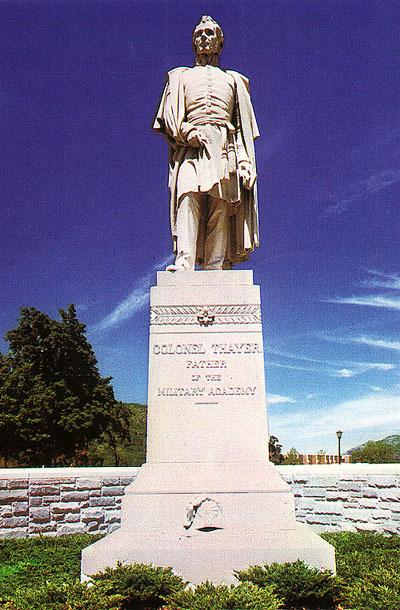 It was in this period that West Point saw the development of one of its greatest field generals. 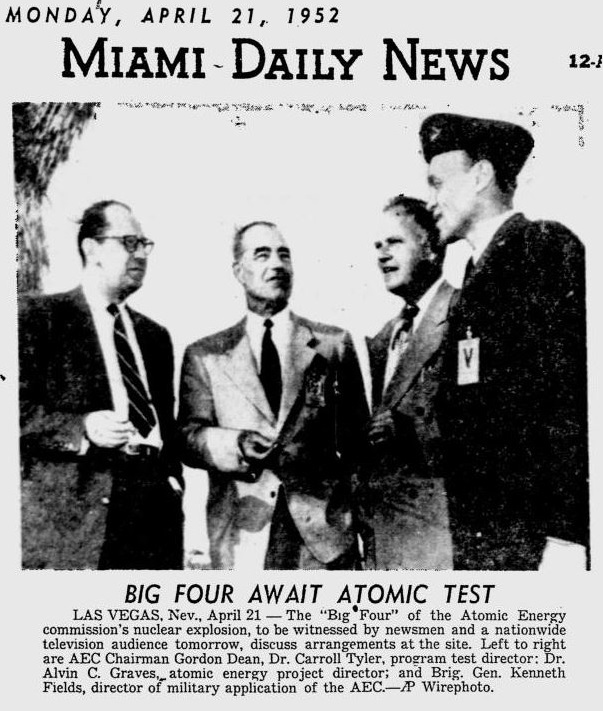 There was nothing impressive in the physical ap[Pg 221]pearance of little H. L. Hyatt. A reasonably good man, ball in hand, his greatest value lay in his head work. 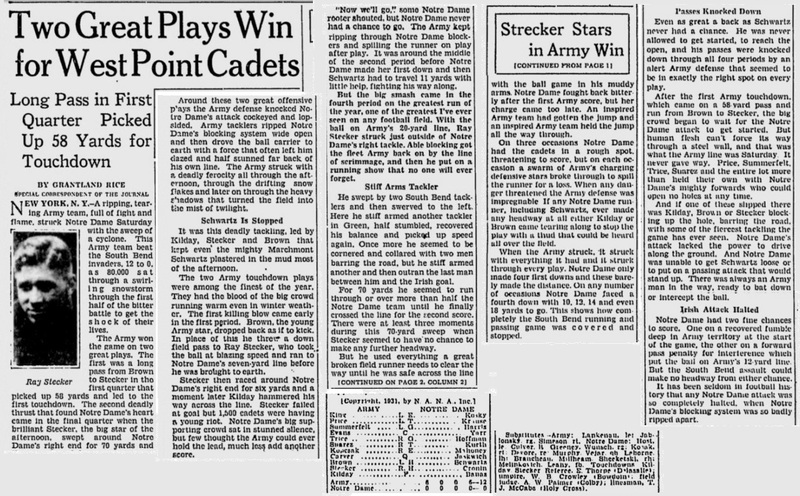 As the West Point trainer said one day: “I’ve got him all bandaged up like a leg in a puttee, but from the neck up he’s a piece of ice.” The charts of games in which Hyatt ran the team are set before the squad each year as examples, not merely of perfect generalship, but of the proper time to violate that generalship and make it go, a distinction shared by Prichard, who followed in his footsteps with added touches of his own. One cannot mention Prichard’s name without thinking at once of Merillat, who, with Prichard, formed one of the finest forward passing combinations the game has seen. 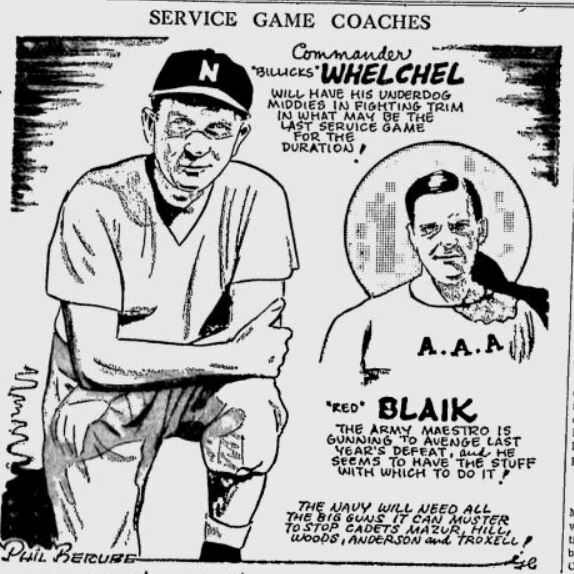 Both at Franklin Field and at the Polo Grounds this pair brought woe to the Navy. 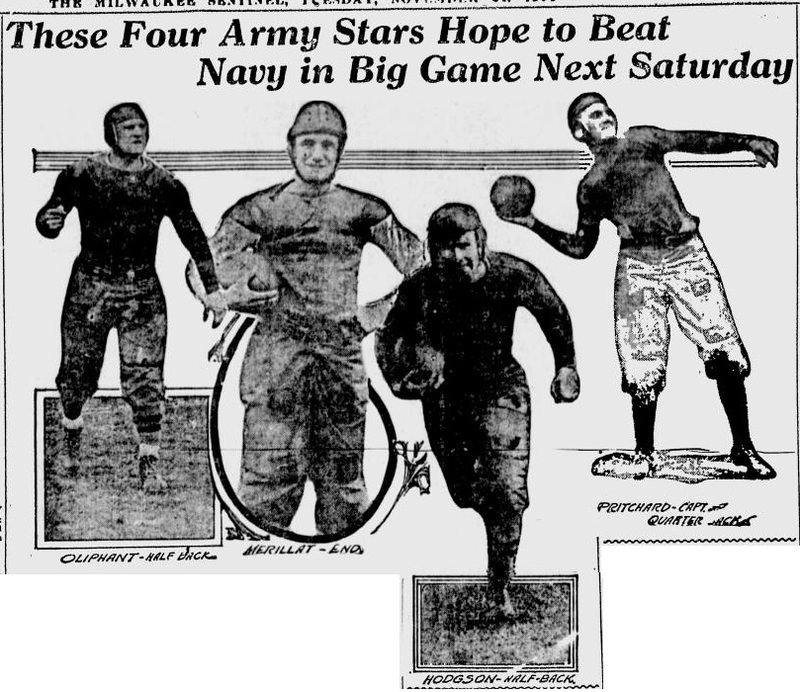 These stars had able assistance in the persons of McEwan, one of the greatest centers the game has seen and who was chosen to lead the team in 1916, Weyand, Neyland and O’Hare, among the forwards, and the brilliant and sturdy Oliphant in the backfield, the man whose slashing play against the Navy in 1915 will never be forgotten. Oliphant was of a most unusual type. 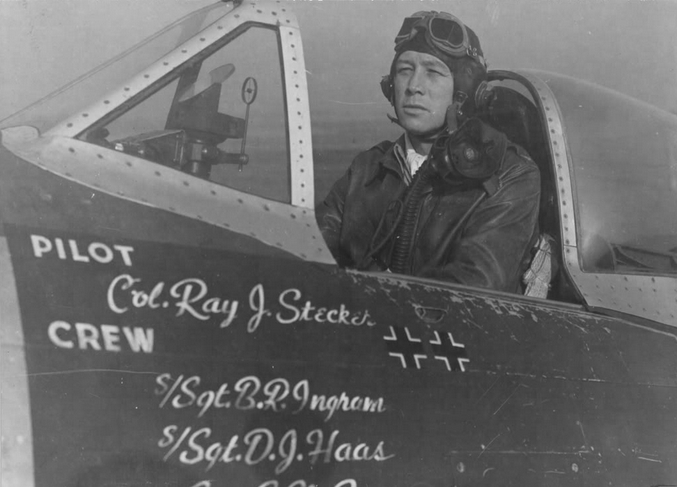 Even when he was doing the heaviest damage to the Navy Corps the midshipmen could not but admire his wonderful work. What the Hustlers are to Annapolis the Cullom Hall team is to West Point. It is made up [Pg 222]of the leftovers from the first squad and substitutes. One would travel far afield in search of a team with more spirit and greater pep in action, whether playing in outside games, or as their coach would put it, “showing up” the first Eleven. Not infrequently a player of the highest caliber is developed in this squad and taken to the first eleven. The Cullom Hall squad, whose eleven generally manages to clean up some of the strongest school teams of the Hudson Valley, draws not a little of its spirit, I think, from the late Lieutenant E. M. Zell, better known at the Academy as “Jobey.” It was a treat to see the Cullom Hall team marching down the field against the first Eleven with the roly-poly figure of Jobey in the thick of every scrimmage, coaching at the top of his lungs, even when bowled over by the interference of his own pupils. Since his time the squad has been turned over to Lieutenants Sellack and Crawford, who have kept alive the traditions and the playing spirit of this unique organization. Their reward for the bruising, hard work, with hardly a shadow of the hope of getting their letter, comes in seeing the great game itself. Like the college scrub teams the hardest rooters for the Varsity are to be found in their ranks. Now for the game itself. Always hard fought, always well fought, there is perhaps no clash of all the year that so wakes the interest of the gen[Pg 223]eral public, that vast throng which, without college affiliations, is nevertheless hungry for the right of allegiance somewhere, somehow. 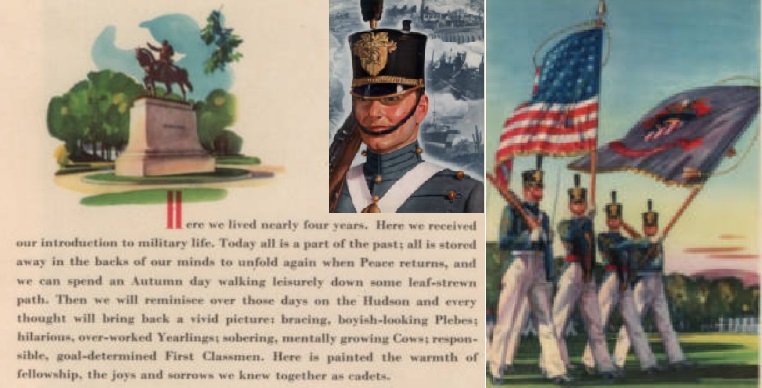 While the Service Elevens are superbly supported by the men who have been through the exacting mill at West Point and Annapolis—their sweethearts and wives, not to mention sisters, cousins, uncles and aunts—they are urged on to battle by that great impartial public which believes that in a sense these two teams belong to it. It is not uncommon to find men who have had no connection with either academy in hot argument as to the relative merits of the teams. Once in the stands some apparently trifling thing begets a partisanship that this class of spectator is wont to wonder at after it is all over. 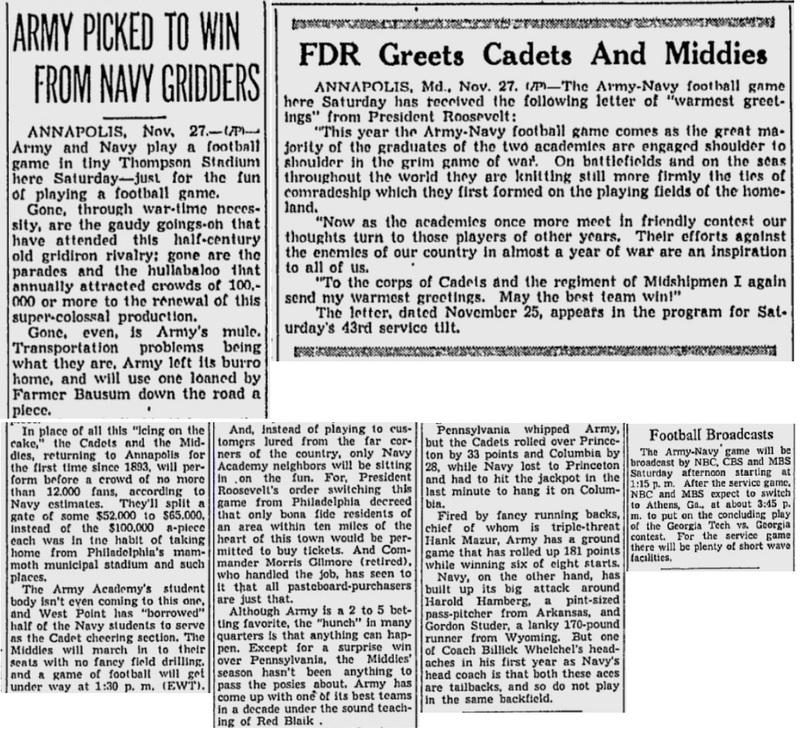 Whether in Philadelphia in the earlier history of these contests on neutral ground, or in New York, Army and Navy Day has become by tacit consent the nearest thing to a real gridiron holiday. For the civilian who has been starved for thrilling action and the chance to cheer through the autumn days, the jam at the hotels used as headquarters by the followers of the two elevens satisfies a yearning that he has hitherto been unable to define. There too, is found a host of old-time college football men and coaches who hold reunion and sometimes even bury hatchets. Making his way through the crowds and jogging elbows with the heroes of a sport that he understands only as organized combat he becomes [Pg 224]obsessed with the spirit of the two fighting institutions. Once in possession of the coveted ticket he hies himself to the field as early as possible, if he is wise, in order to enjoy the preliminaries which are unlike those at any other game. Soon his heart beats faster, attuned to the sound of tramping feet without the gates. 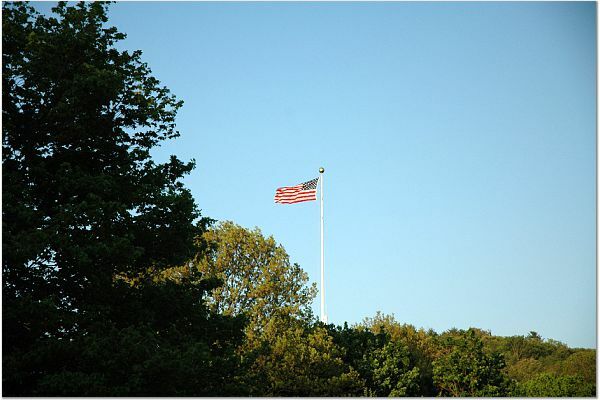 The measured cadence swells, draws nearer, and the thousands rise as one, when first the long gray column and then the solid ranks of blue swing out upon the field. The precision of the thing, the realization that order and system can go so far as to hold in check to the last moment the enthusiasms of these youngsters thrills him to the core. Then suddenly gray ranks and blue alike break for the stands, there to cut loose such a volume of now orderly, now merely frenzied noise as never before smote his ears. It is inspiration and it is novelty. The time, the place and the men that wake the loyalty dormant in every man which, sad to say, so seldom has a chance of expression. Around the field are ranged diplomat, dignitary of whatsoever rank, both native and foreign. 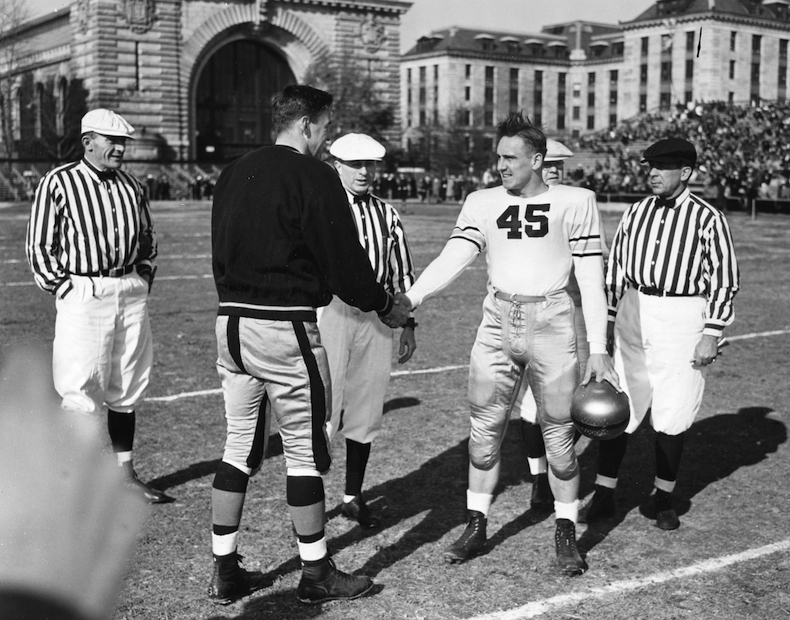 In common with those who came to see, as well as to be seen—and who does not boast of having been to the Army-Navy game—they rise uncovered as the only official non-partisan of football history enters the gates—the President of the United States. Throughout one half of the [Pg 225]game he lends his support to one Academy and in the intermission makes triumphal progress across the field, welcomed on his arrival by a din of shouting surpassing all previous effort, there to support their side. It is perhaps one of those blessed hours in the life of a man upon whom the white light so pitilessly beats, when he can indulge in the popular sport, to him so long denied, of being merely human. Men, methods, moods pass on. The years roll by, taking toll of every one of us from highest to lowest. 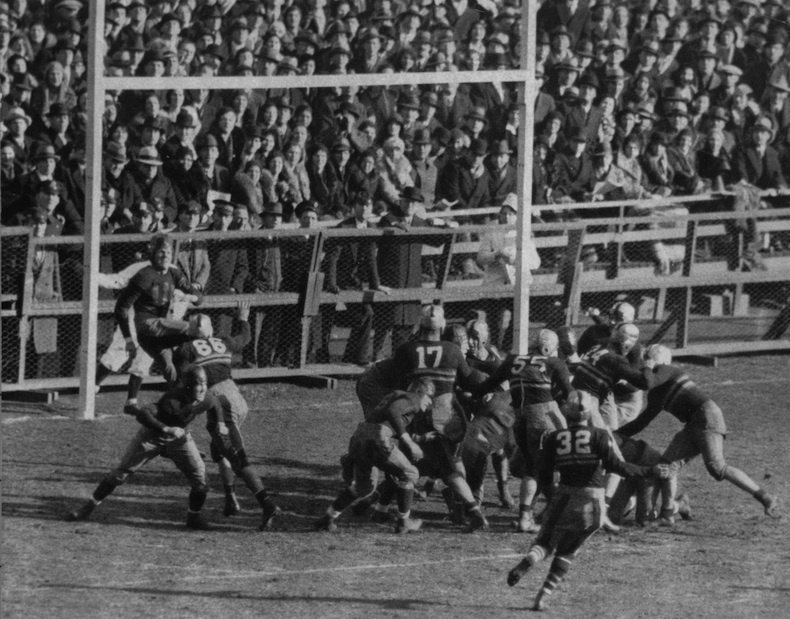 Yet, whether we are absorbed in the game of games, or whether we look upon it as so many needs must merely as a spectacle, the Army-Navy game will remain a milestone never to be uprooted. I have spoken elsewhere and at length of football traditions. 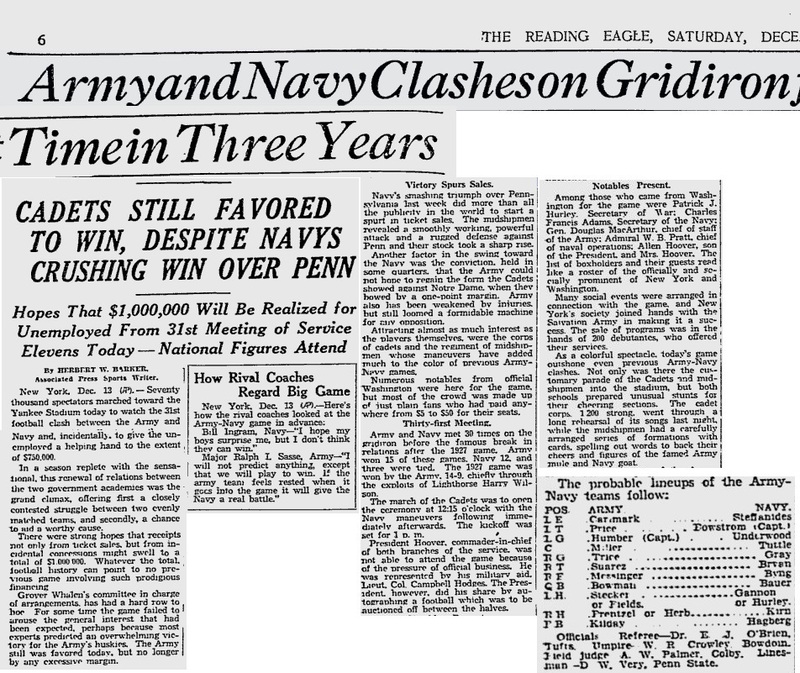 The Army-Navy game is not merely a football tradition but an American institution. It is for all the people every time. May this great game go on forever, serene in its power to bring out the best that is in us, and when the Great Bugler sounds the silver-sweet call of taps for all too many, there will still be those who in their turn will answer the call of reveille to carry on the traditions of the great day that was ours. 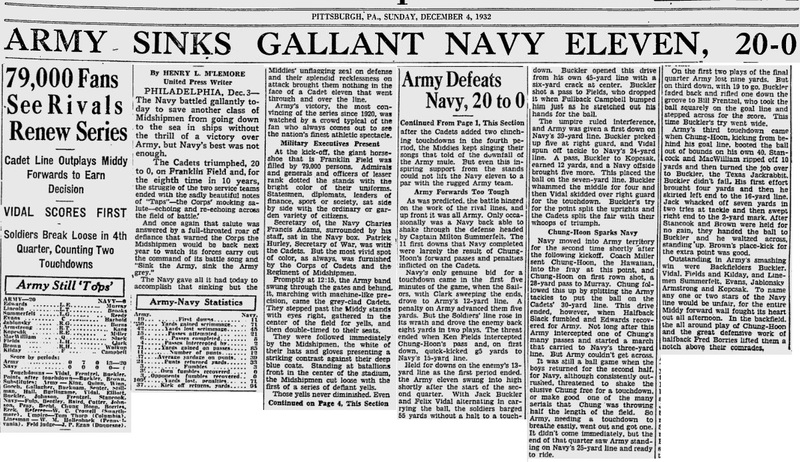 Navy 24, Army 0 Nov. 29, 1890 – West Point, N.Y. 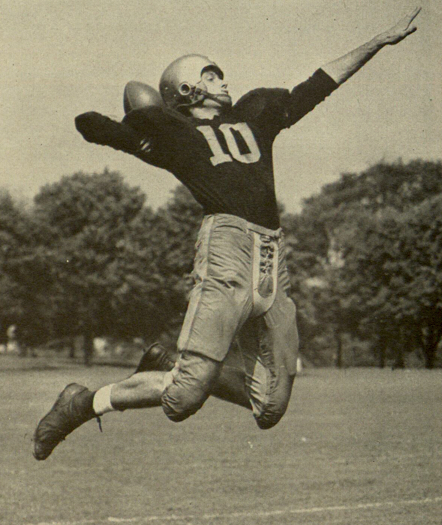 Veteran Red Emerich scored 20 of Navy’s 24 points in its series-opening shutout of the host Cadets. 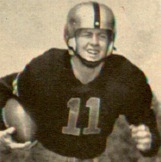 Moulton Johnson added the other touchdown (touchdowns were worth four points), as the Mids served as Army’s first college football opponent. 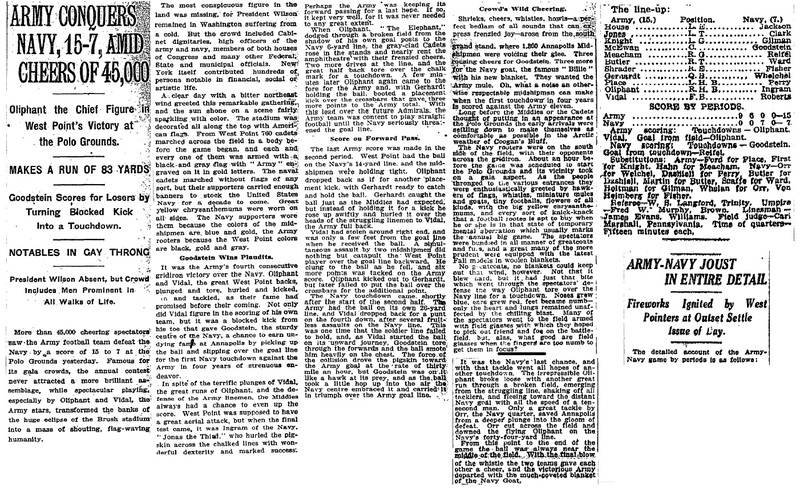 Army 32, Navy 16 Nov. 28, 1891 – Annapolis, Md. Army avenged its series-opening loss to Navy by doubling up the Midshipmen, 32-16, in Annapolis. The Cadets overpowered the Midshipmen on the ground, scoring three first-half touchdowns to take an 18-6 lead at intermission. 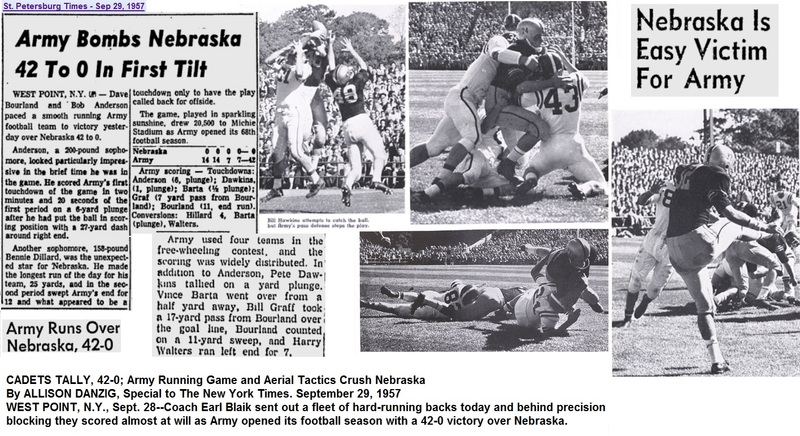 Elmer Clark scored on two touchdown runs, while plebe Fine Smith blocked Worth Bagley’s punt and returned it for a touchdown. Navy was not to be embarrassed on its home field and answered with touchdowns from C.F. Maclin and Henry Pearson to open the second half. Nonetheless, the Cadets padded their lead with two more touchdowns to provide the 16-point difference. 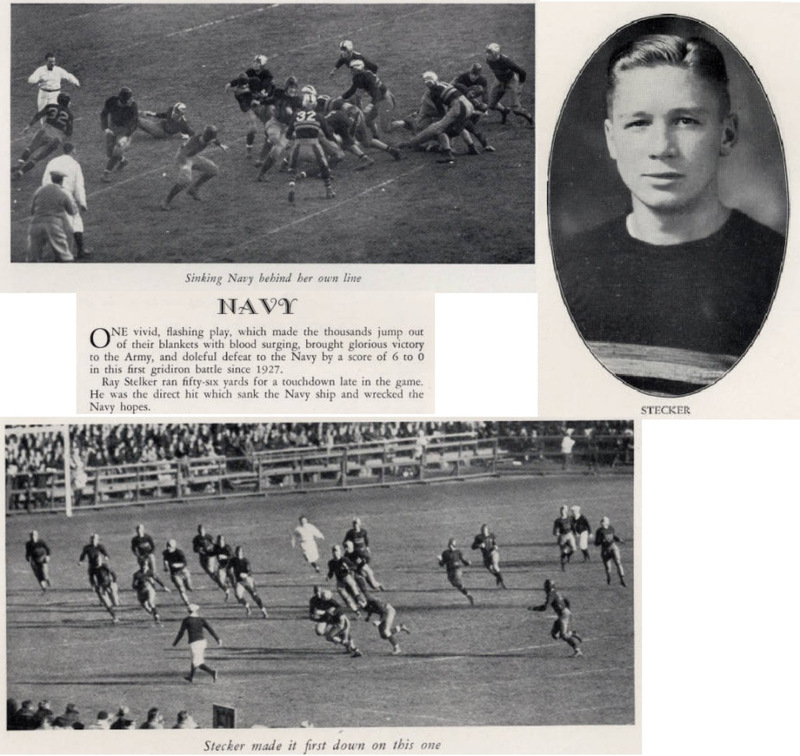 Navy 12, Army 4 Nov. 26, 1892 – West Point, N.Y.
Worth Bagley proved to be quite valuable to Navy, accounting for eight of the team’s 12 points in a 12-4 win over Army. All of the scoring came in the second half. 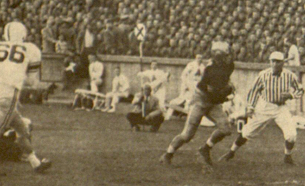 Walter Izard had Navy’s first touchdown run, and Bagley added the conversion. Army’s Thomas Carson answered with a touchdown for the Cadets, but Bagley put the game away with six more points late in the half. 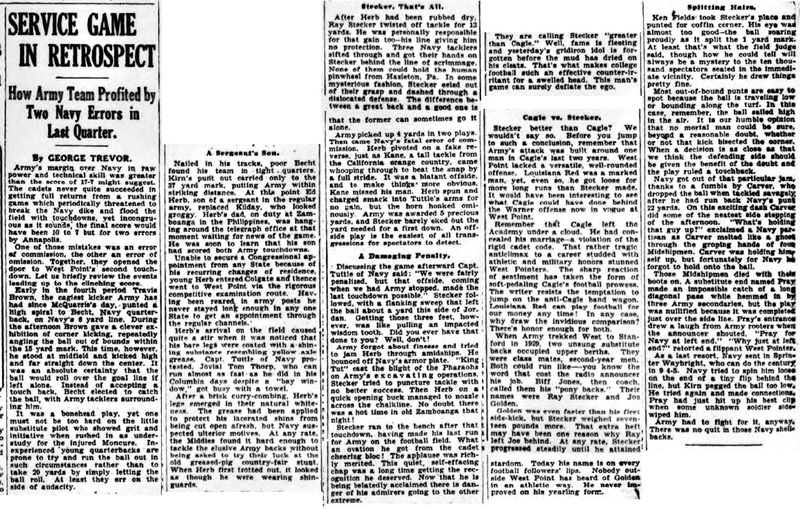 Navy 6, Army 4 Dec. 2, 1893 – Annapolis, Md. Henry Kimball’s one-yard touchdown run and two-point conversion was all Navy needed in a 6-4 victory over Army. 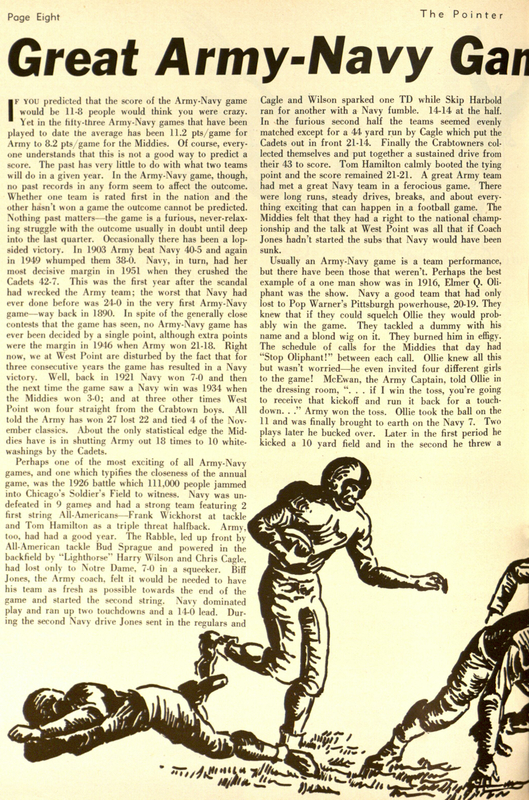 The Cadets’ Thomas Carson responded with his second touchdown in as many years against Navy, but the two-point conversion was unsuccessful. 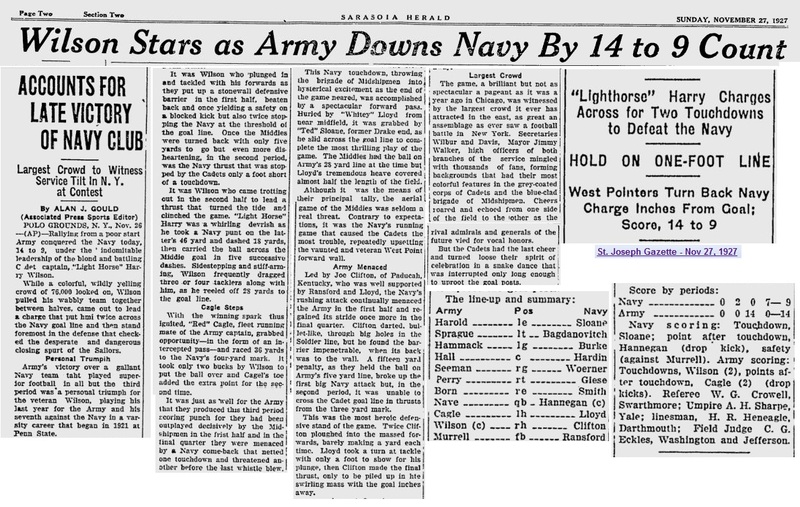 Army 17, Navy 5 Dec. 2, 1899 – Philadelphia, Pa. 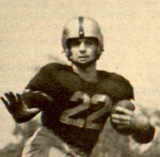 In the first Army-Navy game held at Franklin Field, Army’s Verne Rockwell and Bob Jackson combined to score three touchdowns in the Cadets’ 17-5 victory. 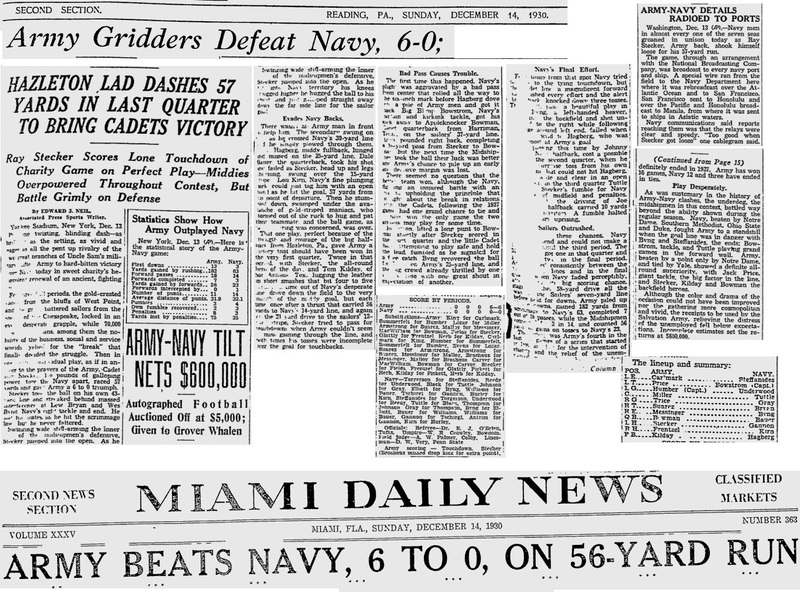 Considering Navy had shut out its previous three opponents – North Carolina, Trinity and Lehigh – by a combined 71-0 score, this game was termed an upset of sorts. After Jackson started the scoring in the first half with a short run, Navy drove to the Army nine-yard line before time ran out in the half. Rockwell and Jackson tallied second-half scores, as the Cadets took a commanding 17-0 lead. The Midshipmen avoided a shutout when Ward Wortman scored with just seconds left in the game. 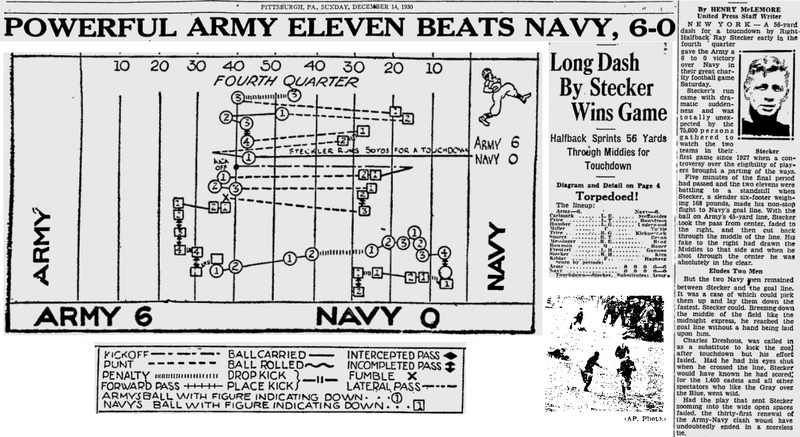 Navy 11, Army 7 Dec. 1, 1900 – Philadelphia, Pa.
Navy’s Bryon Long may have hit the game-tying field goal in the first half, but his recovery of a blocked punt in the end zone proved more valuable in the Midshipmen’s 11-7 win over Army. Emory Land’s touchdown run early in the second half snapped a 5-5 tie and made the score 11-5 after Orie Fowler’s extra point. Then, with 10 seconds left in the game, the Cadets’ Quinn Gray blocked Charles Belknap’s punt into the Navy end zone. If Gray recovers the punt, it’s an Army touchdown. But if Long recovers it, it’s a safety. 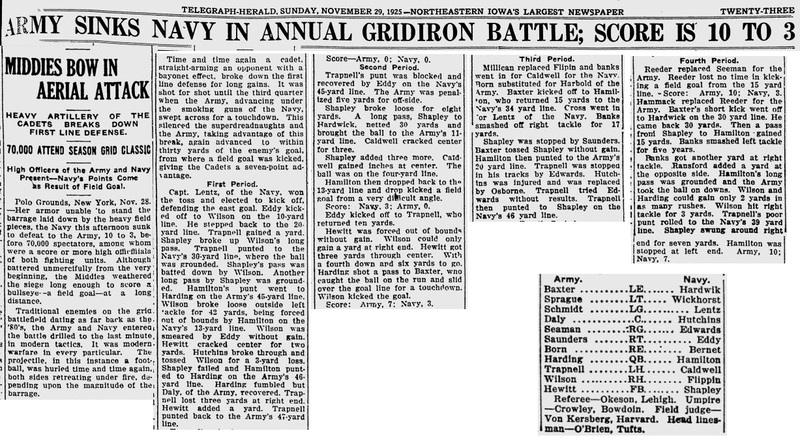 Fortunately for the Midshipmen, Long pounced on the ball in the end zone, and Navy had itself an 11-7 triumph. 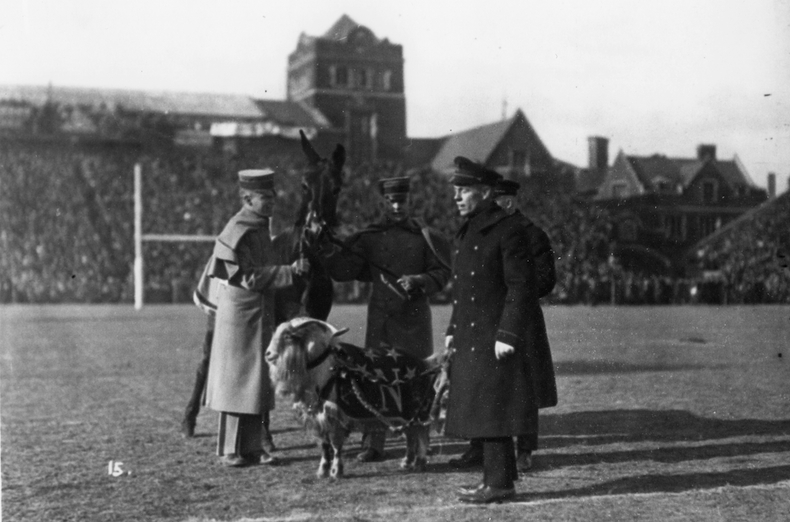 Army 11, Navy 5 Nov. 30, 1901 – Philadelphia, Pa.
Vice President Theodore Roosevelt, who was sworn in as chief executive right after William McKinley was assassinated, became the first president to watch an Army-Navy game. He saw Army quarterback Charles Daly turn in a fine individual performance, leading the Cadets past Navy, 11-5. 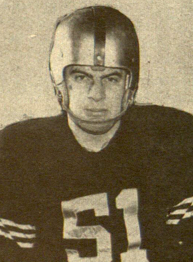 Daly opened the scoring with a first-half field goal, only to have Navy’s Newton Nichols tie the score with a touchdown just before intermission. The multi-talented Daly then took the wind out of Navy’s sails with a 95-yard kickoff return for a touchdown to open the second half and clinch the 11-5 victory. 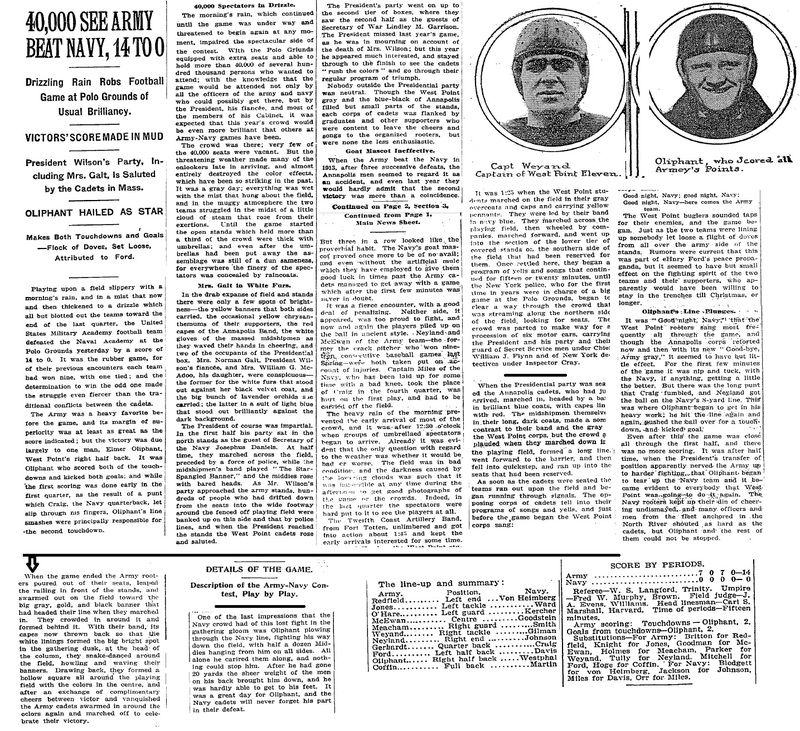 Army 22, Navy 8 Nov. 29, 1902 – Philadelphia, Pa. Offense, defense and special teams each had a hand in Army’s 22-8 victory over Navy. 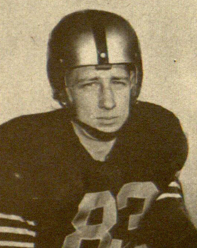 Paul Bunker and quarterback Charles Daly each had rushing touchdowns for the Cadets, while Navy’s Ralph Strassburger tackled Daly in the end zone for a safety. Navy cut Army’s lead to 10-8 just before halftime when Strassburger returned a punt 55 yards for a touchdown. The Cadets held off the furious Navy comeback with a pair of second-half touchdowns. 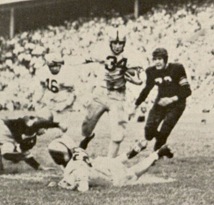 Bunker reached the end zone for the second time that afternoon, while Daly scored a touchdown and added the extra point. 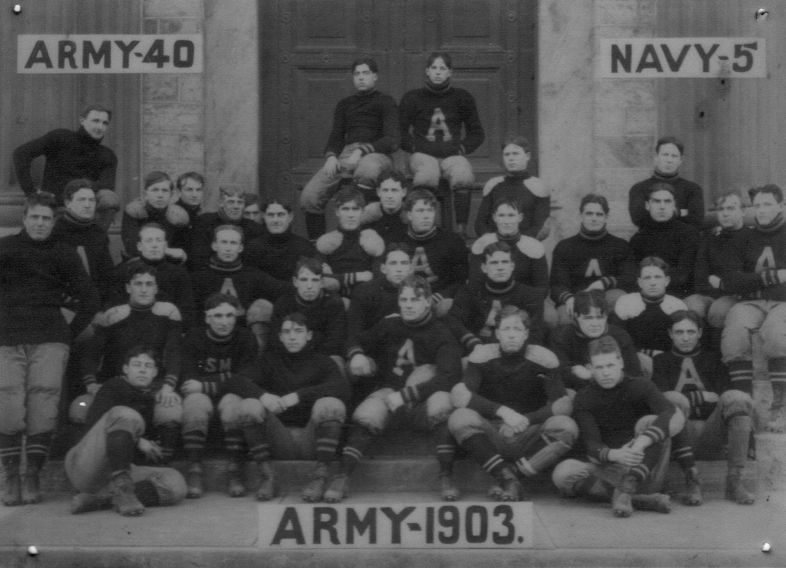 Army 40, Navy 5 Nov. 28, 1903 – Philadelphia, Pa.
Army used two Navy fumbles and a blocked field goal attempt to overcome a five-point deficit and overwhelm the Midshipmen, 40-5. Navy took a 5-0 lead on an H.L. Chambers field goal in the first half, but that was the extent of the Mids’ offensive output. They mustered just three first downs the rest of the day. Army, on the other hand, boasted a balanced scoring attack. 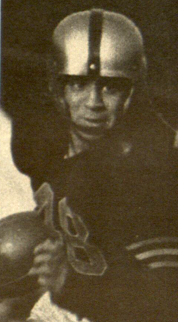 Fred Prince had 15 points, Ray Hill added 10, Tom Doe seven, Russell Davis five, while Ernest Graves, Charles Davis and Horatio Hackett had one point each. 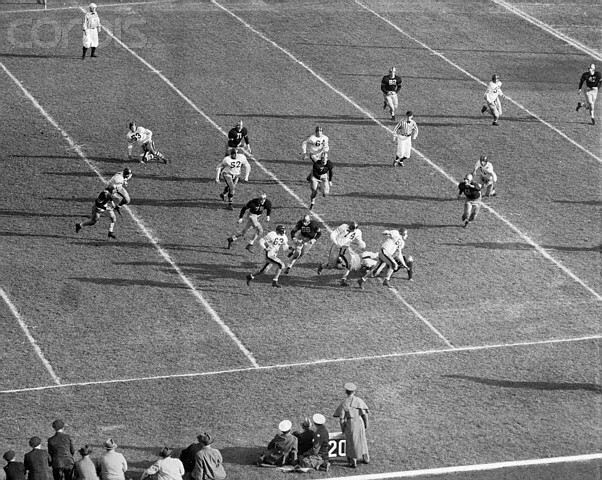 Army 11, Navy 0 Nov. 26, 1904 – Philadelphia, Pa.
Midway through the first half, Navy lined up to accept Army’s punt at the 50-yard line. 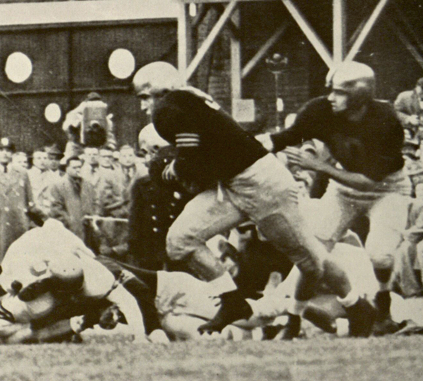 The ball apparently touched Navy’s Homer Norton, and the Cadets’ Art Tipton, racing down the field, kicked the ball ahead of him. 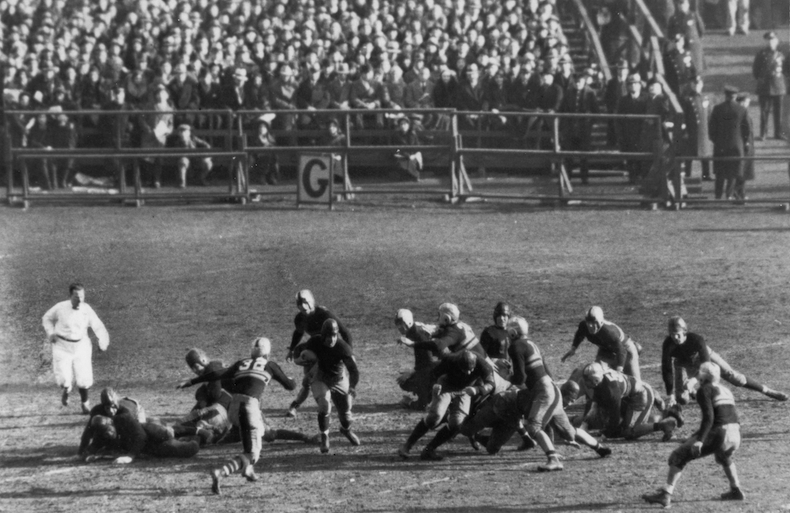 The game had suddenly transformed into a modern day soccer match, with Tipton kicking the ball once again toward the Navy goal line. 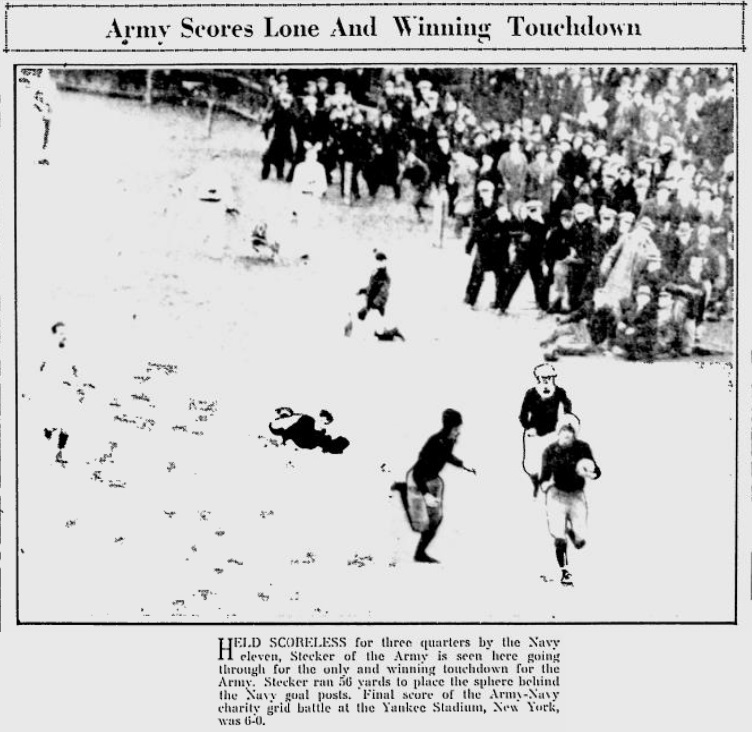 When the ball reached the end zone, Tipton fell on top of it for Army’s first touchdown. Despite the controversy surrounding this incident, it was ruled a touchdown and set the tone for Army’s 11-0 triumph. This was the Cadets’ fourth win in a row over Navy and Army’s first shutout in series history. 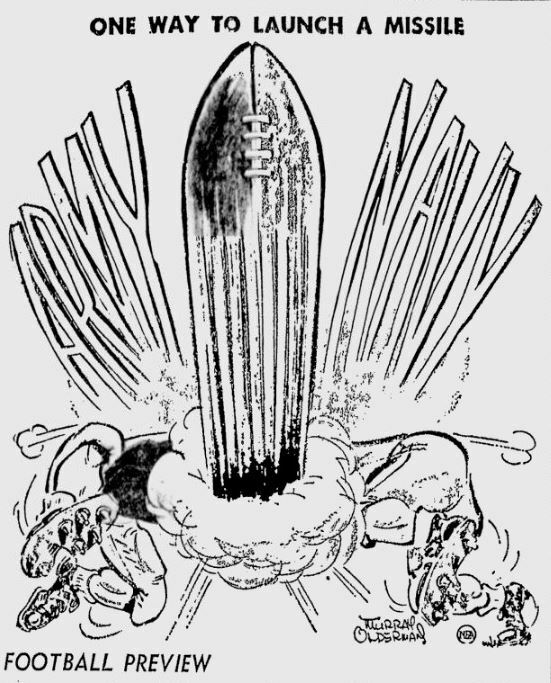 Navy 6, Army 6 Dec. 2, 1905 – Princeton, N.J.
Princeton President Woodrow Wilson convinced West Point and Annapolis officials to play the 1905 Army-Navy game at Princeton, where the two service academies battled to a 6-6 tie. 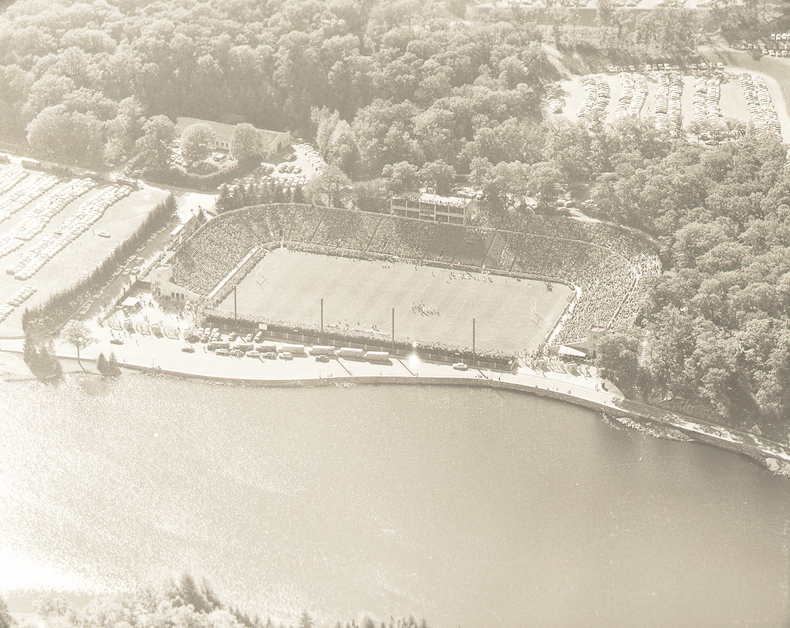 It was immediately obvious that Princeton was ill-equipped to handle the large crowd in attendance, as a huge traffic jam made both teams late for kickoff. As a result, the game was suspended with four minutes left due to darkness. 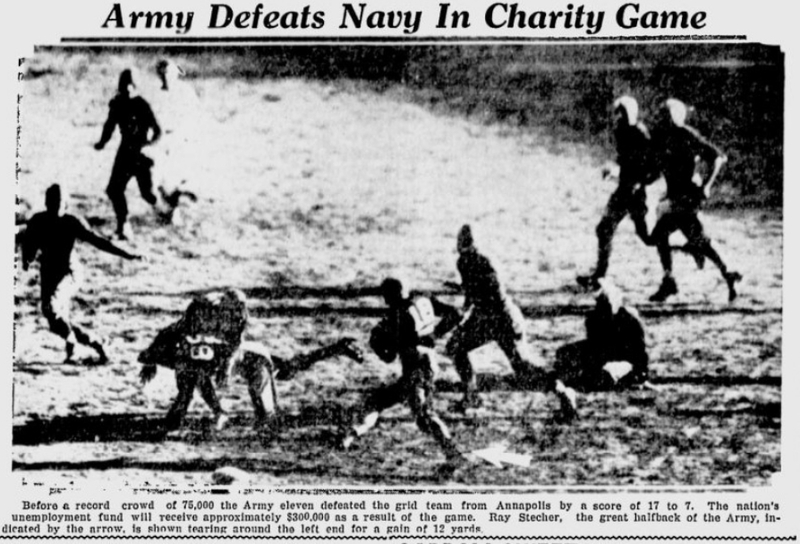 Henry Torney scored Navy’s touchdown early in the first half, while Archibald Douglas tallied Army’s touchdown. 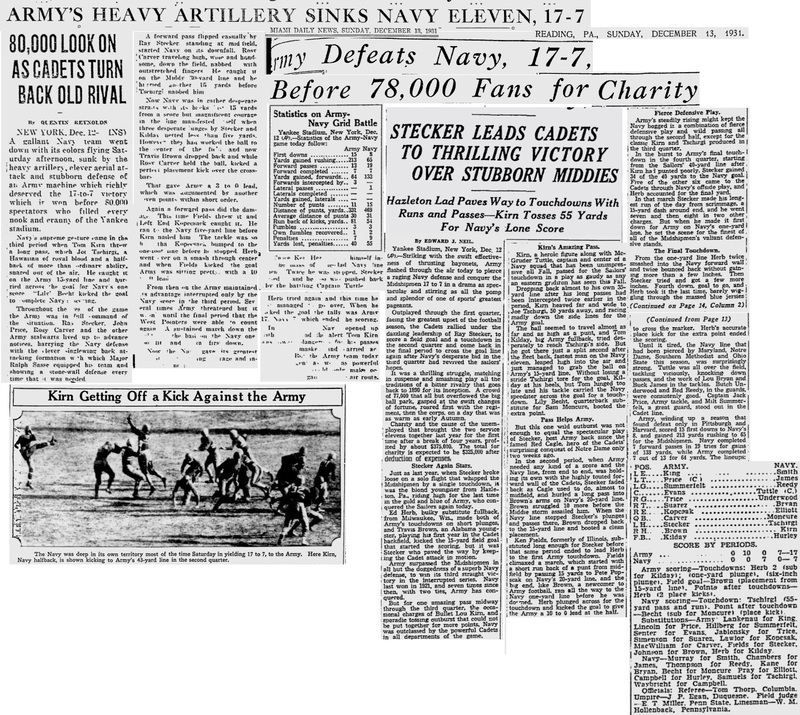 Navy 10, Army 0 Dec. 1, 1906 – Philadelphia, Pa.
“Anchors Aweigh” made its debut at the 1906 Army-Navy game, and the Midshipmen took the song to heart in defeating the Cadets, 10-0. 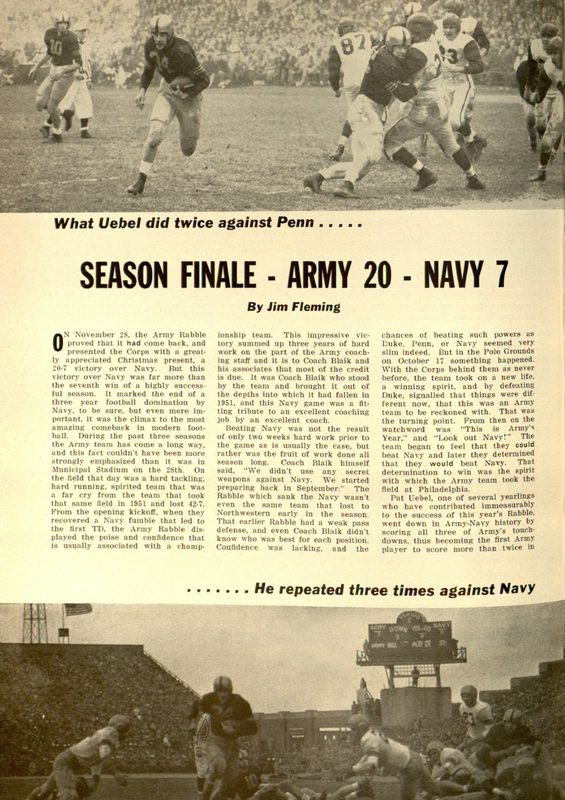 The win over Army was Navy’s first since 1900. 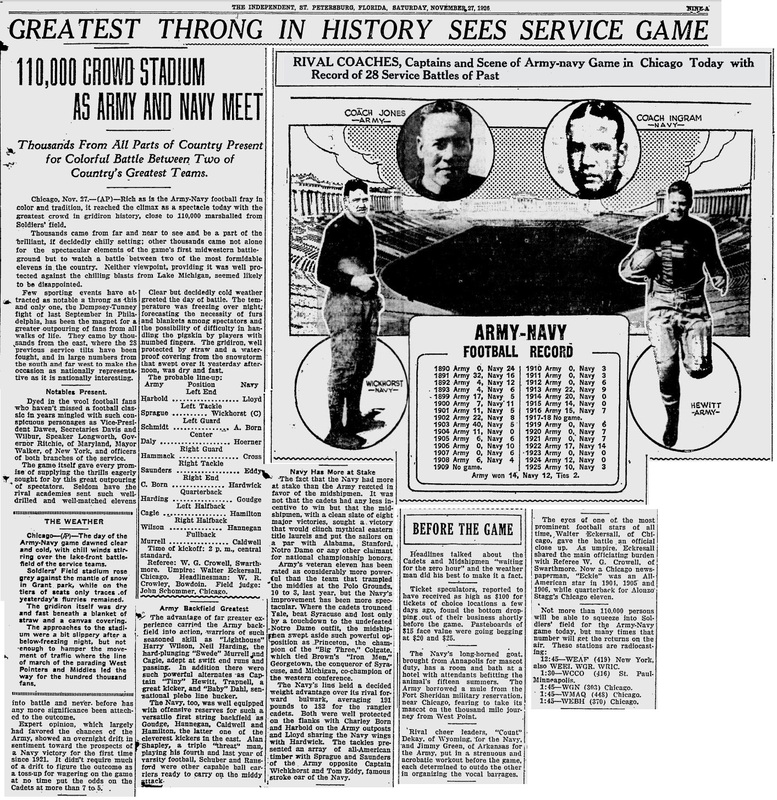 The 1906 football season was memorable nationwide, as it marked the debut of the forward pass. Navy coach Paul Dashiell added a twist to this new rule to help his team to victory. Thanks to a long field goal by Percy Northcroft, Navy led 4-0 in the second half. On the Mids’ next possession, Navy’s Homer Norton dropped back in punt formation. Yet, when the ball was snapped, he threw a 25-yard touchdown pass to Jonas Ingram to give Navy the 10-0 victory. 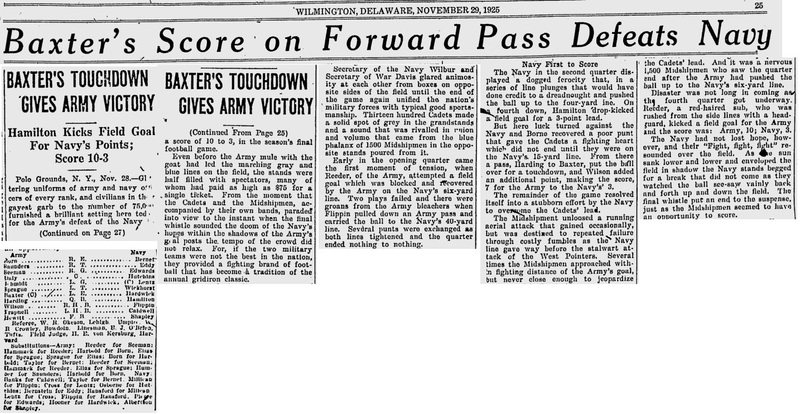 Navy 6, Army 0 Nov. 7, 1907 – Philadelphia, Pa.
Navy combined an early Army turnover with a solid defensive outing to turn back the Cadets, 6-0. 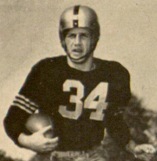 The Midshipmen’s Percy Wright recovered Frederick Montiford’s punt at the Army 25-yard line. 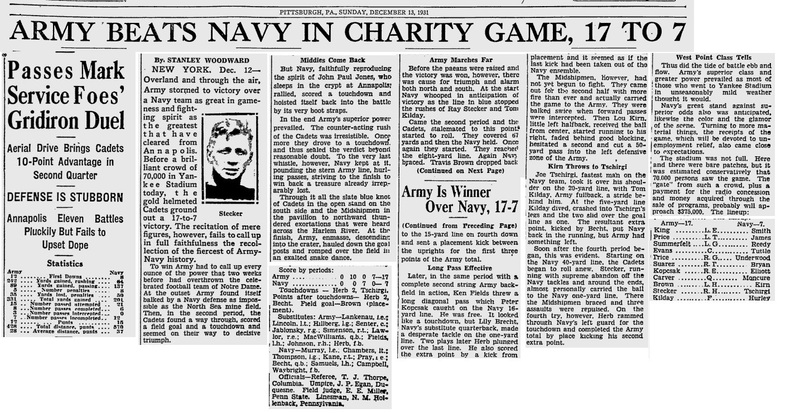 It took Navy six plays to score, as Archibald Douglas plowed through from the one-yard line to give Navy all of the points it would need in its second-straight shutout over Army. 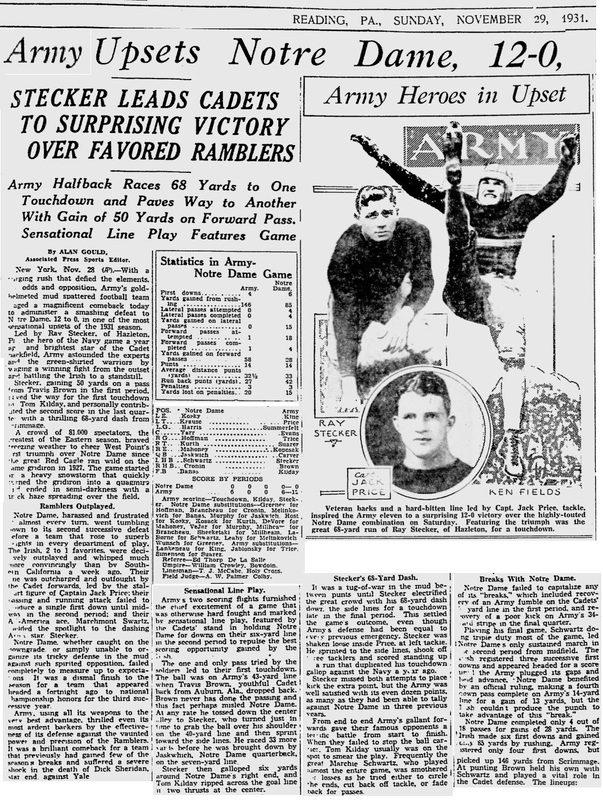 Army 6, Navy 4 Nov. 28, 1908 – Philadelphia, Pa.
Ed Lange’s fumble on the opening kickoff proved costly to Navy, as Army’s Henry Chamberlain retrieved the loose ball and raced all the way to the Navy one-yard line. 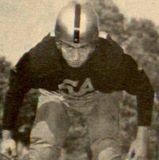 From there, Bill Dean crossed the goal line for the touchdown (worth five points). 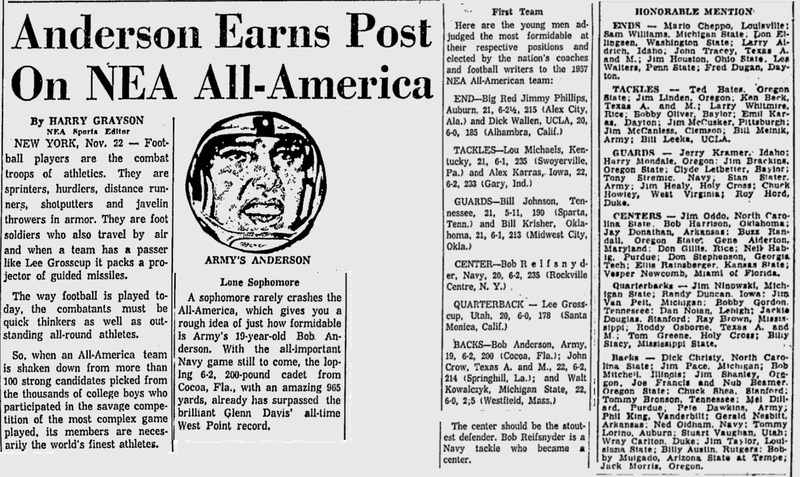 He kicked the extra point himself to account for all six points in the 6-4 Army win. Lange somewhat redeemed himself by kicking a second-half field goal (worth four points), but it wasn’t enough to upend the Cadets. Rivals Leave For Big Game – West Point Cadets and Annapolis Middies Depart for Battle Field. 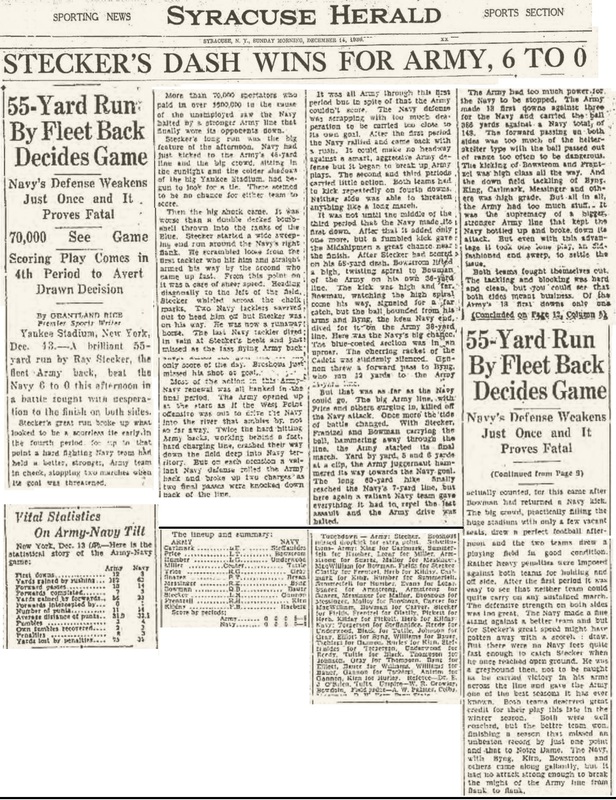 PHILADELPHIA, Penn., Nov 28 — The thirteen engagement in the perennial strife of football between West Point and Annapolis went into history this afternoon with a score of “Army, 6, and Navy, 4,” to be emblazoned in Army archives, and to be recorded on the other side of the ledger at Annapolis.